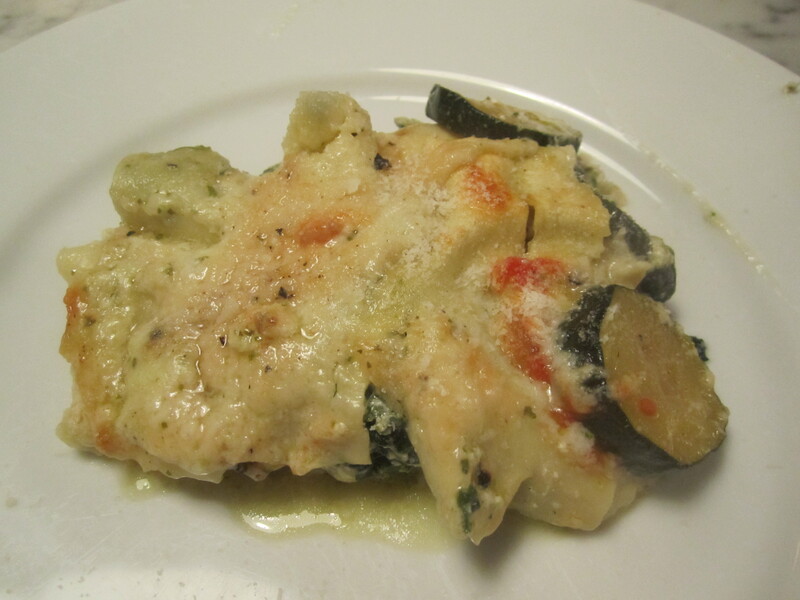 This recipe came from a wonderful memoir/cookbook that I recently read entitled “Perdutamente–Crazy for Italian Food” by prolific cookbook author and friend, Joe Famularo. Greeks, Arabs, Byzantine, Normans–all of these civilizations have occupied Sicily at various times throughout history, and all have left their aromatic spices in the Sicilian culinary repertoire. The sound of curry and pasta intrigued me–I happen to love curry and don’t routinely cook with it, so this was a new experience for me. I broke one of my cardinal entertaining rules and made the dish for guests, without having tried it first on myself. My guests assured me they were happy to act as my food testers and proclaimed the dish a success. I’ve modified the recipe here only slightly, reducing the amount of cream, and eliminating the preliminary salting and draining of the eggplant–a step which I’ve come to feel is generally unneccessary. 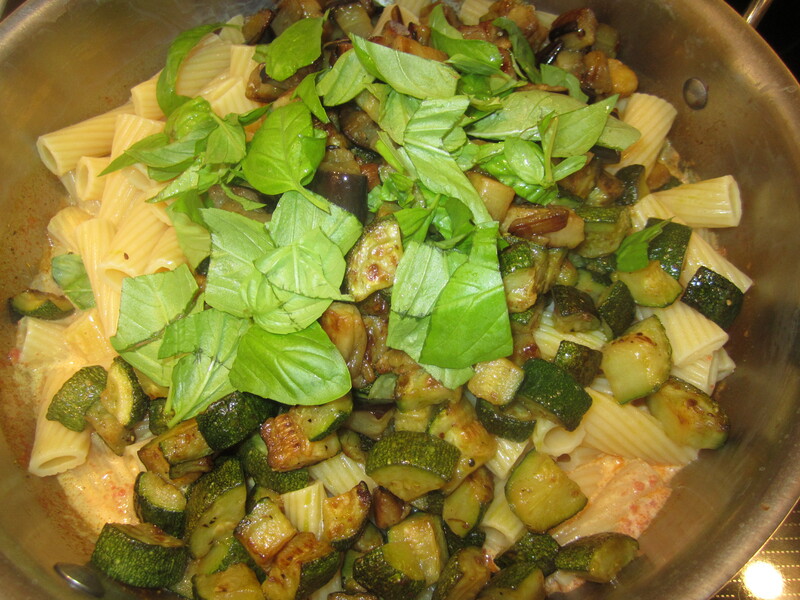 Right now, here in Florida, I happen to have access to beautiful local in-season zucchini, eggplant and tomatoes at my farmers’ market, which made the dish all the more appealing to make. Additionally, there is a spice vendor at the market who grinds and roasts a myriad of wonderful spices and blends. His madras curry had a wonderful aroma, so I bought a tiny quantity of it, knowing that it will lose its pungency over time. Now I have reason to experiment with curry until I use up my little bag of it. This recipe takes about 45 minutes from start to finish. 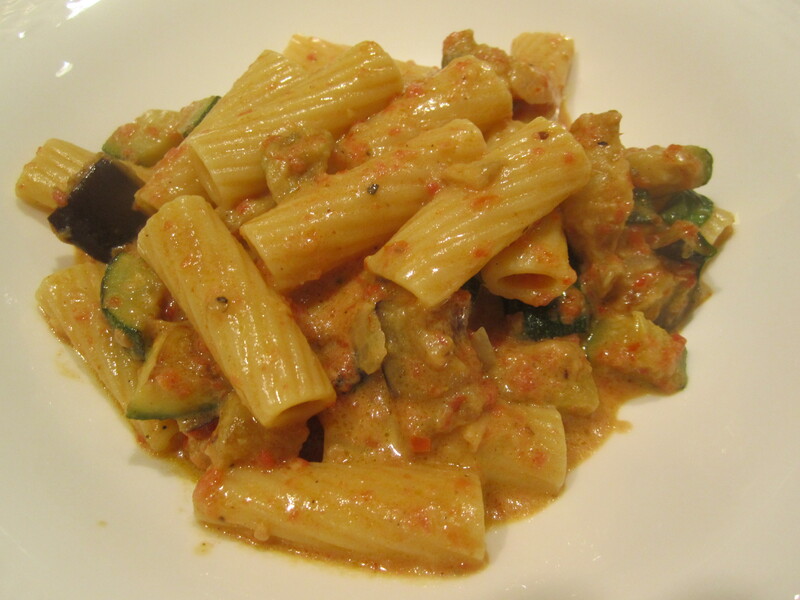 The vegetables and tomato sauce may be made in advance, then the dish takes only about 15 minutes to assemble and plate. Partially peel eggplant, leaving the occasional strip of skin on. Cut into 3/4″ cubes. 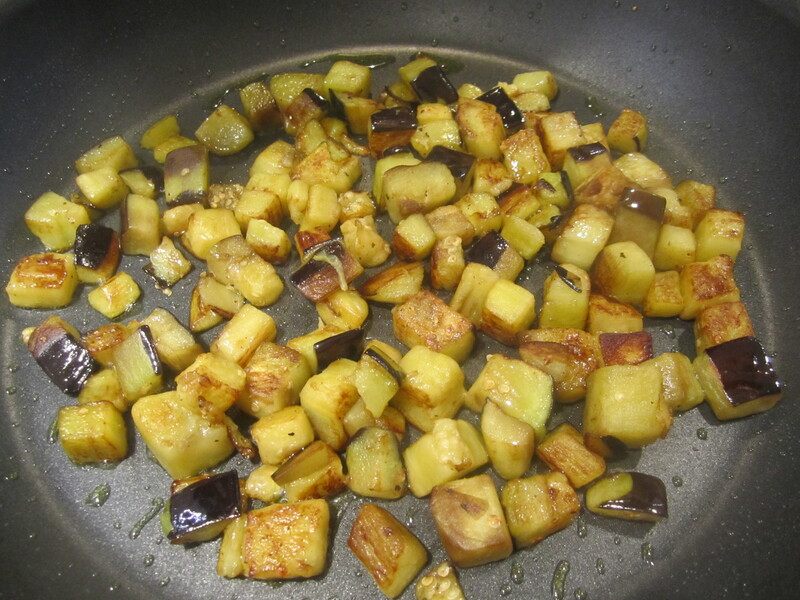 Saute in 1/4 cup olive oil over high heat until lightly golden and soft (about 10 minutes). Add salt to taste. Set aside. Add another 2 tablespoons olive oil to the same skillet. 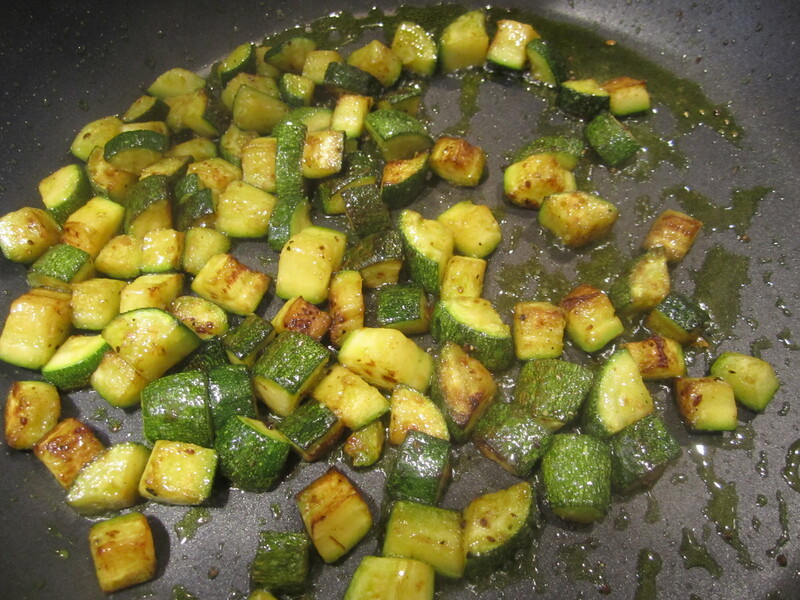 Dice zucchini into 3/4″ cubes and sauté until slightly golden and tender (another 10 minutes). 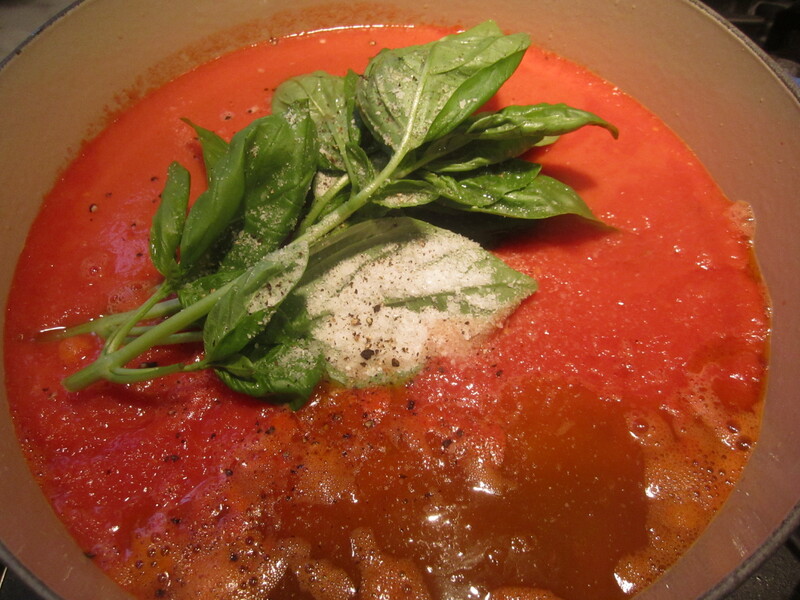 Make tomato sauce by pureeing grape tomatoes in the food processor, then placing in a small pot. Add the half onion, 6 basil leaves, and 2 tablespoons olive oil. Bring to a simmer and allow to perk away on low heat for about 15 minutes. Remove onion, taste and add salt and pepper. Set aside. The dish may be prepared to this point about an hour ahead of time. When ready to serve, bring pasta water to a boil and add enough salt to make it aggressively salty. 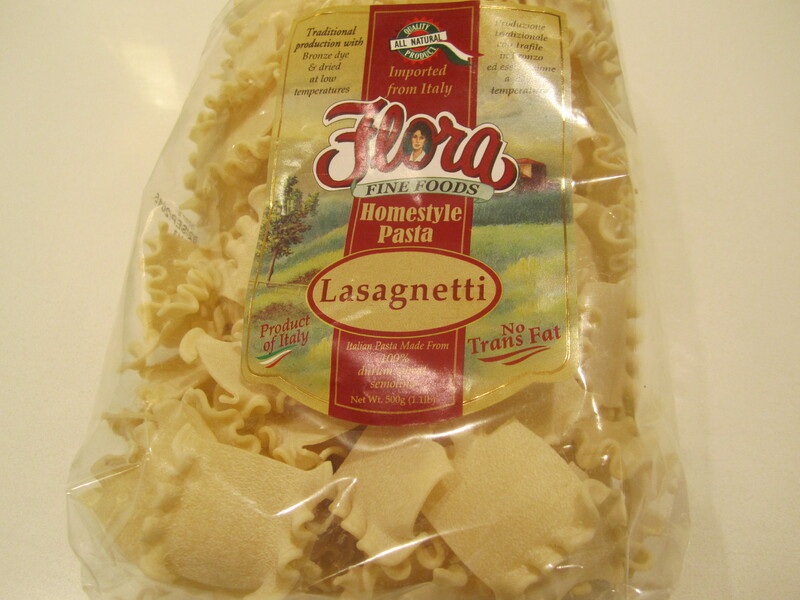 White pasta is cooking, prepare sauce in a skillet large enough to hold pasta and sauce. 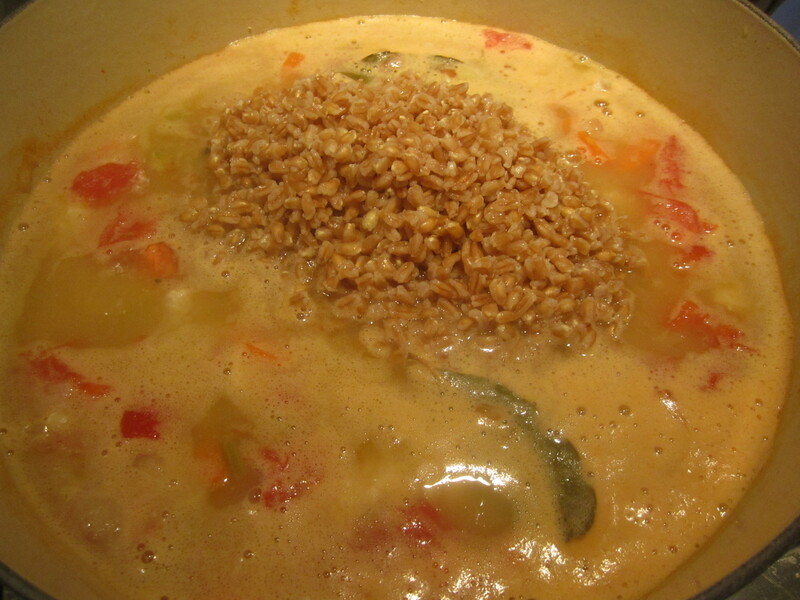 Combine tomato sauce, heavy cream, and curry and bring to a simmer. 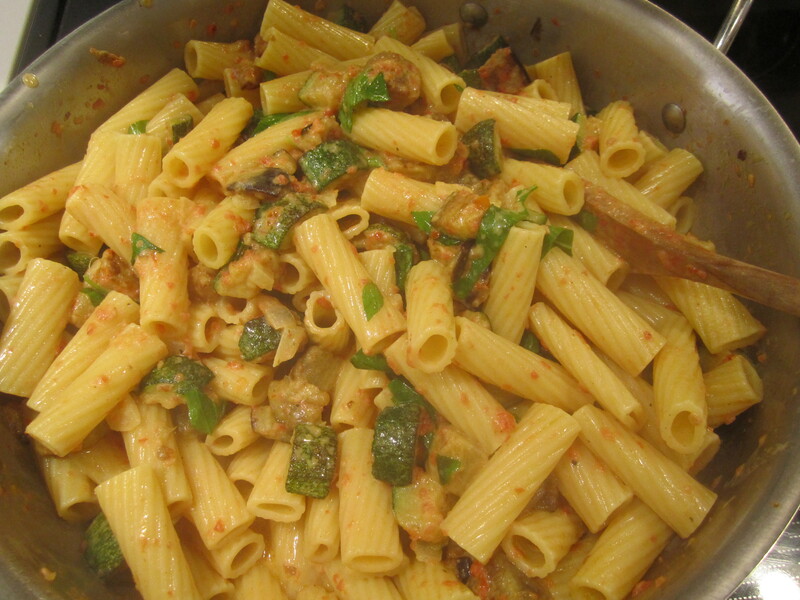 Add cooked pasta and vegetables to the sauce and top with the remaining basil leaves. Add in about a cup of pasta cooking liquid and stir for about a minute over high heat to combine pasta with sauce. 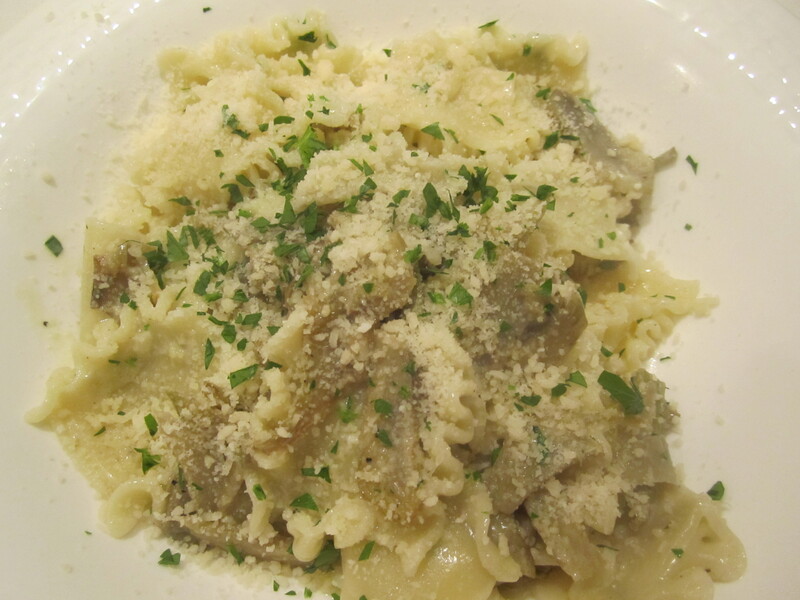 Serve with plenty of grated parmigiano at the table. It’s been a while since a dish inspired me to write about it, but a couple of weeks ago, I was invited to dinner at the home of friends who’ve been living in Italy for the last 30 years and have a winter home here in Florida. They have an impeccable sensibility, so I knew the meal would be great. 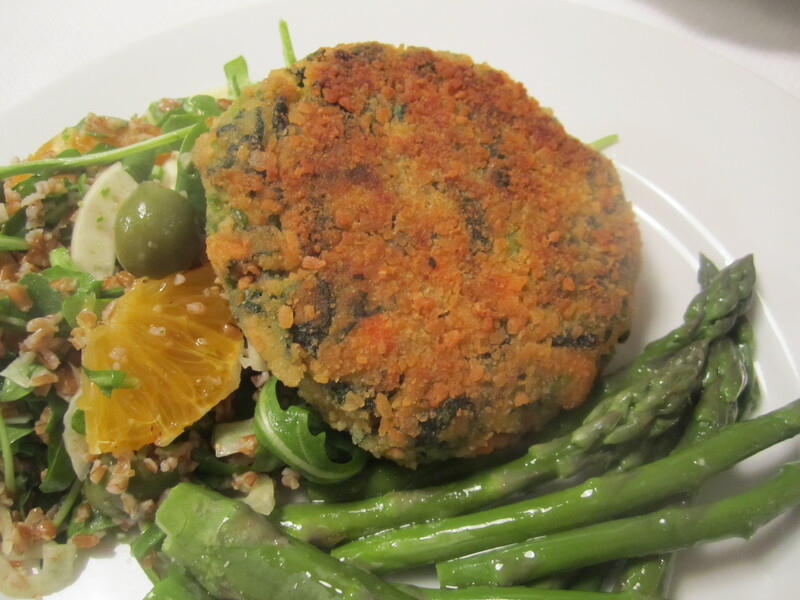 The meal was a simple buffet, which consisted of thinly pounded and breaded chicken cutlets, broccoli di rapa (simply dressed with olive oil from their own olive trees), and lasagnetti with artichokes. Everything was simply prepared and beautifully presented, but the pasta impressed me the most–it had a complex, rich flavor that I couldn’t quite identify. The combination of artichokes and heavy cream was one I’d never tried, so I was intrigued enough to try my hand at making the dish. My friend Paul was kind enough to share the recipe with me, so I’ve made it a couple of times, until it was to my satisfaction. Paul used baby artichokes, which he was quick to point out, are a different breed in Italy than they are here in the states. Although the baby artichokes in our supermarket look healthy and green and have no chokes, they still require extensive cleaning and discarding of leaves until only the most tender and palest leaves are left. The first time I tried to make the dish, I used baby artichokes (as Paul did), but I made the mistake of not stripping them enough. I’ve written posts on artichokes in the past, and failed to take my own advice, which is that artichokes–even baby ones, when cleaned properly, result in 90 percent waste and 10 percent edible product. So I decided to re-try the recipe using large globe artichokes, cleaning them mercilessly, until only the palest green-white pieces were left. After I cleaned the artichokes (and before slicing them), I placed them in a deep bowl of water, sprinkled with a couple of tablespoons of flour, instead of lemon juice–a trick that Paul shared with me. It works as well as lemons, but without the wasted lemons. The artichokes are sautéed in olive oil and garlic, white wine is added, then the mixture is simmered for 15 – 20 minutes until tender. This step can be done ahead, then at the last minute, as the pasta is nearing completion, heavy cream is added to the artichokes, along with a generous sprinkle of parmigiano cheese. I suppose that the quality I couldn’t identify in the dish was the heavy cream. It truly elevated the artichokes to regal heights. Their acidity was both heightened and tempered by the richness of the cream. If you don’t often use heavy cream (as I do not), this dish will be an extraordinary treat. Fill a mixing bowl with water and stir in the flour with your hands until it is dissolved and the water is a murky, translucent white. 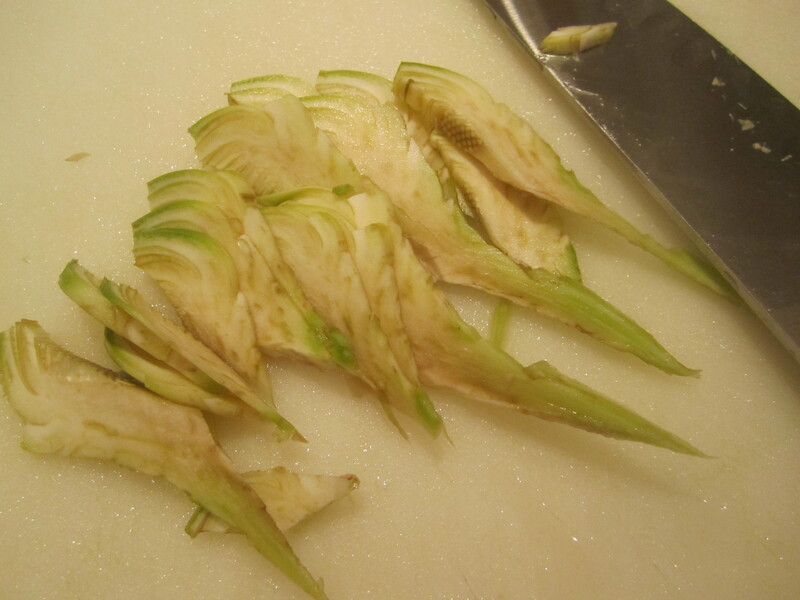 To clean each artichoke, slice crosswise with serrated knife about 1 1/2 inches above the stem. This will result in the elimination of 80 percent of the top of the artichoke, leaving a bottom with stem attached. Peel off any deep green outer leaves which remain on the bottom, then with a paring knife, peel the outside of the bottom and the entire stem. You can separate the stem from the bottom, if this is easier. 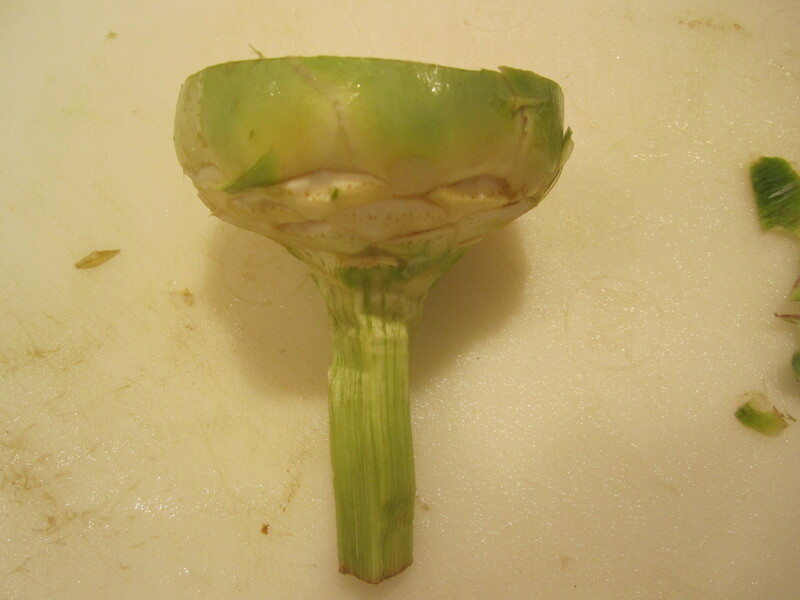 NOTE: If the stem is still a deep green, even after you’ve peeled it–discard–it will be too fibrous. 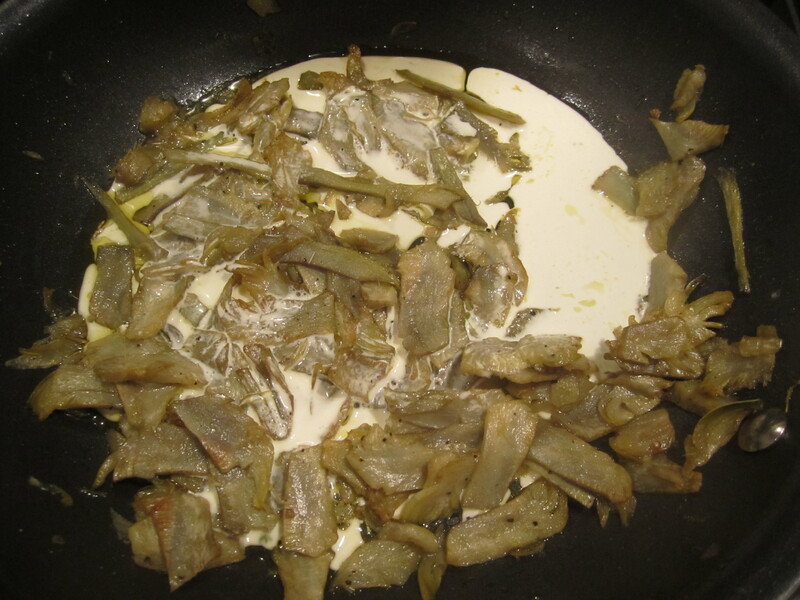 The main way to tell if you’ve gone far enough is that the remaining parts of the artichoke should be pale green–almost white. Quarter the bottom, and working quickly, slice out the choke (the cotton-y mass that lines the inside of the bottom) from each quarter. I find that this is the easiest and quickest way to remove the choke. You want to work quickly because the artichoke discolors instantly once peeled. 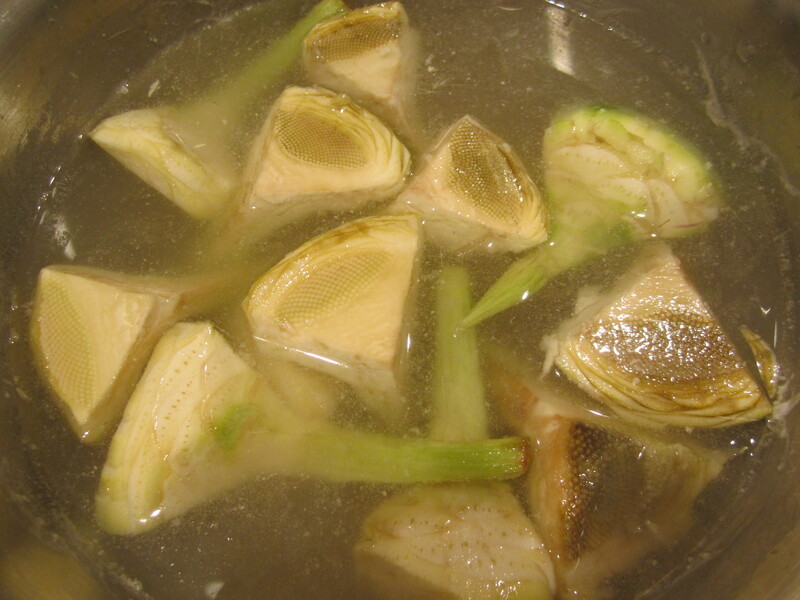 Immediately submerge the peeled and cleaned quarters in the bowl of flour and water, and continue cleaning the remainder of the artichokes. 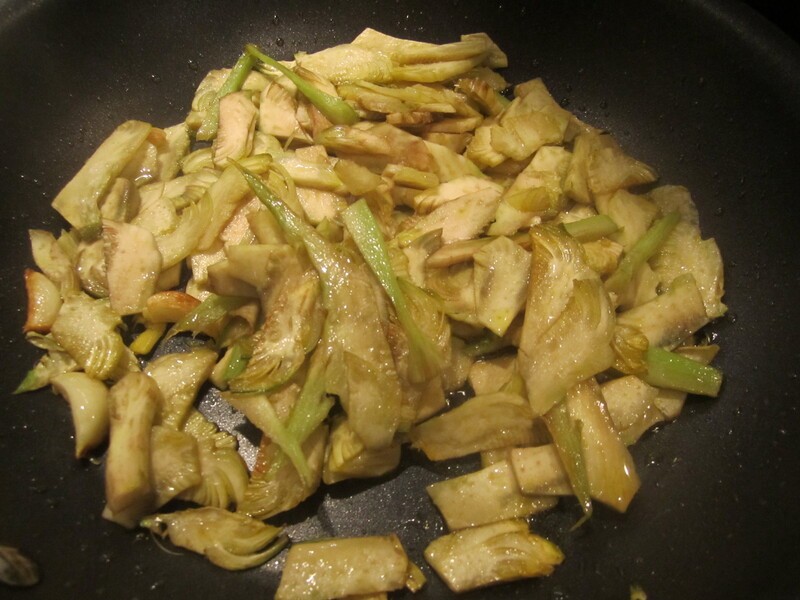 In a skillet, begin slowly browning the garlic and olive oil on very low heat. 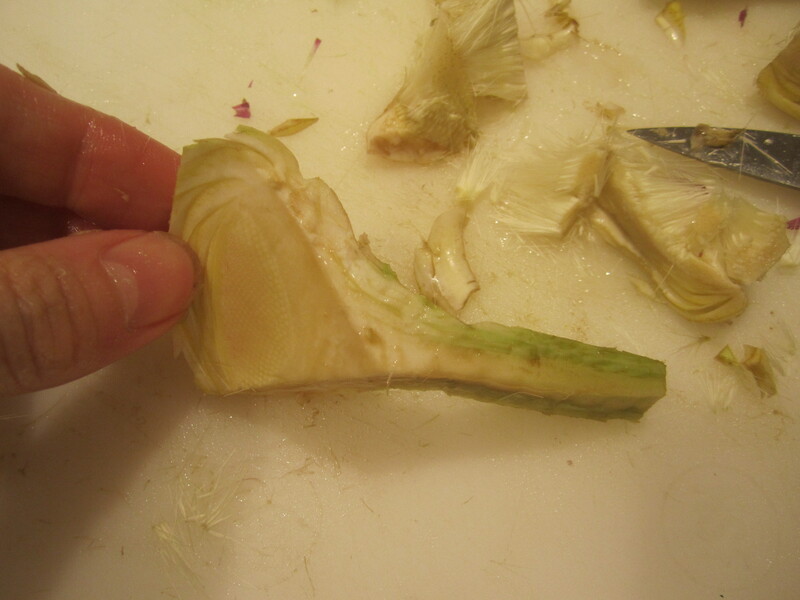 Remove each quarter of artichoke from the water and slice thinly. As each quarter is sliced, add to the skillet with the garlic and oil, until all have been sliced and added to the skillet. 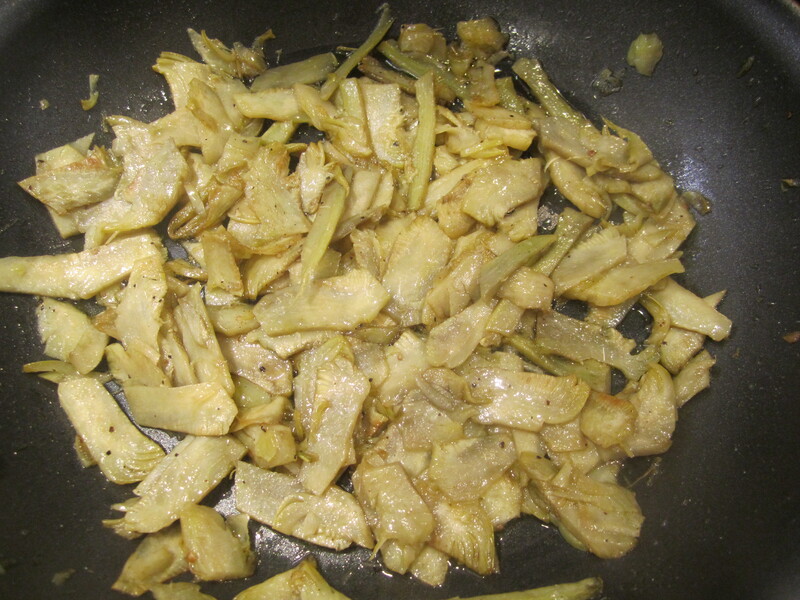 Allow the artichokes to saute on low heat for 5 – 7 minutes on medium heat. 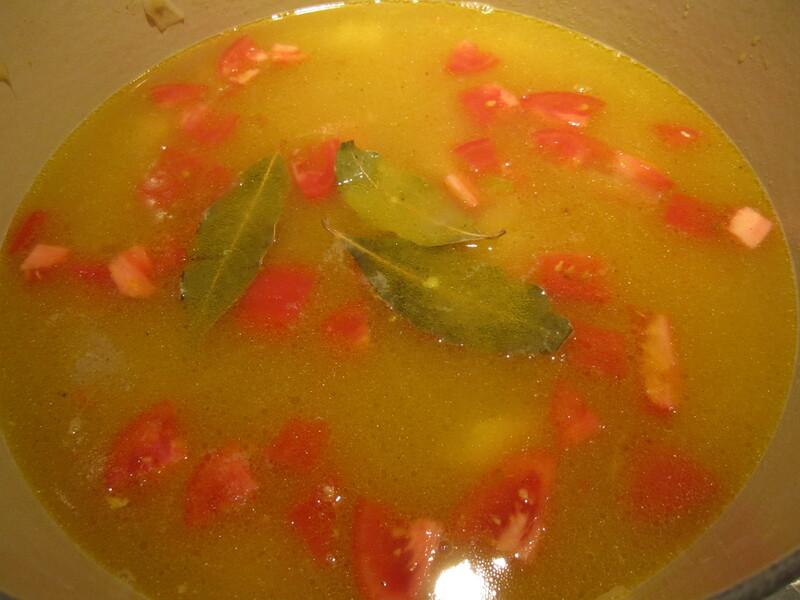 Add the white wine, turn heat to low, and cover, continuing to simmer for about 15 minutes. Taste for salt and pepper and remove from heat. The dish may be made to this point up to an hour ahead of serving. When ready to serve, cook the lasagnetti in plenty of salted boiling water until 2 minutes shy of done. 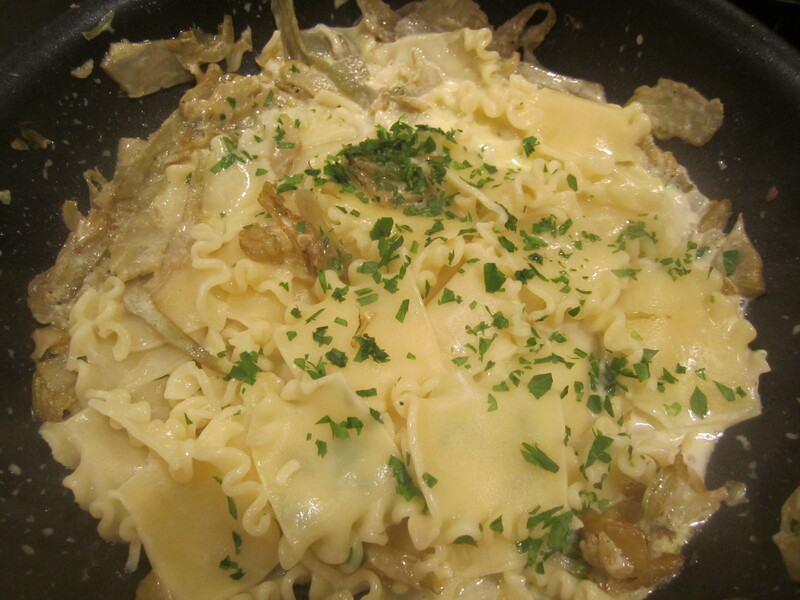 Place the skillet of artichokes on high heat and add heavy cream. 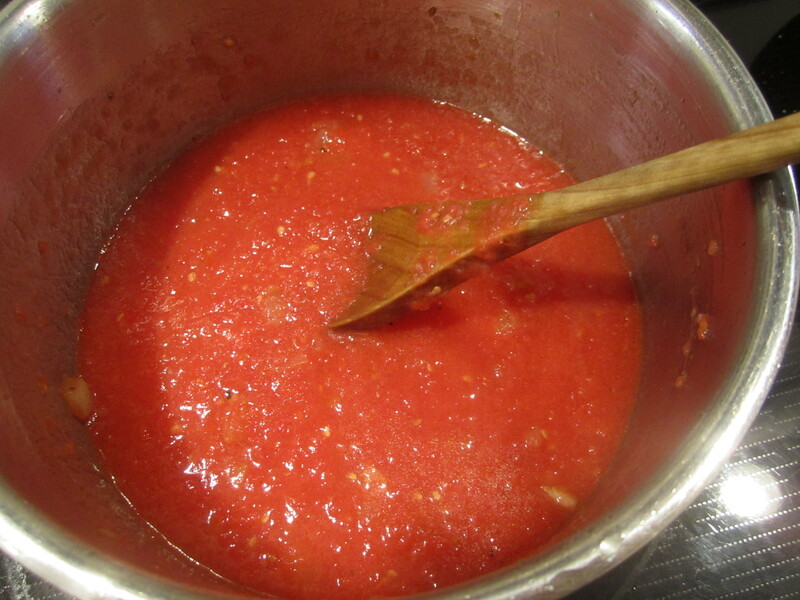 Bring sauce to a bubbling boil, and add drained pasta, along with 2 – 4 tablespoons of pasta water, to thin slightly. Saute the pasta over high heat for a minute or so, adding more pasta water if the mixture is still too tight. Dress with freshly chopped parsley and plenty of grated parmigiano. Pass more parmigiano at the table (there can never be too much). This is the perfect dish to feed a crowd. We’re expecting a houseful of twenty-somethings this weekend, so this dish will be served Friday evening, upon everyone’s arrival, and will provide us with decadent snacks all weekend long. Lasagna is always an opportunity for me to experiment with different combinations of ingredients. Tonight, I’ve decided to make one red lasagna with meat (sweet pork sausage) and the other white, with vegetables (spinach and zucchini). I’ve made a large batch of light tomato-basil sauce for the red lasagna, as well as a double batch of white (béchamel) sauce, which will be added to both the red and white lasagna. The béchamel sauce is the ingredient that elevates these lasagne to something magnificently smooth and decadent. I learned about the magic of béchamel from my cousin Rosanna (who lives in Parma), when she visited and made Lasagna Bolognese for us. In Bologna, lasagna is made by layering thin sheets of homemade spinach pasta with Ragu Bolognese, béchamel, and lots of grated parmigiano reggiano. This is the gold standard of lasagna in Italy, and béchamel is the reason. It tempers the meat sauce and adds a velvety richness that is indescribable. 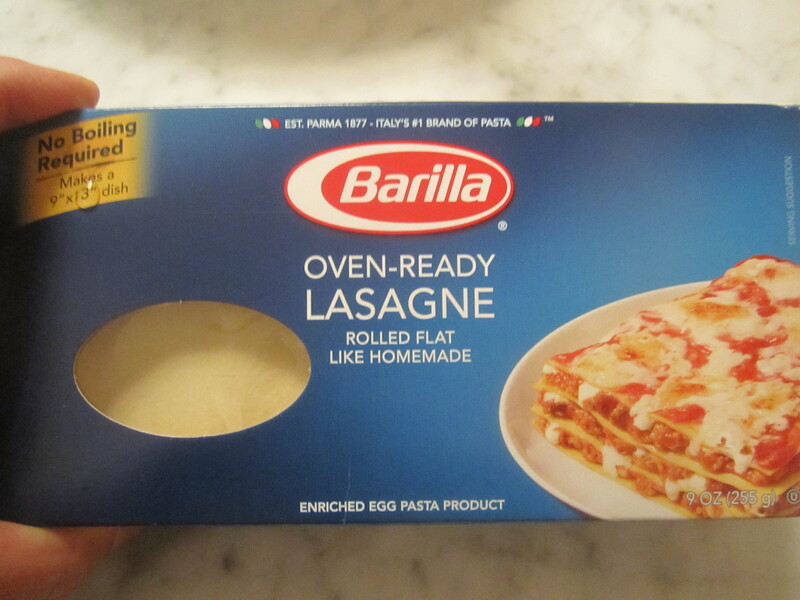 My other secret is no-boil pasta from Barilla. I don’t often tout specific brand names, but this pasta is an absolute necessity in the preparation of virtually foolproof lasagna. These noodles eliminate the need for the pre-boiling of pasta sheets and provide a delicate, light-textured pasta that is almost indistinguishable from homemade (no exaggeration). These noodles absorb great amounts of liquid in the baking process, so the one important aspect of this dish is to have lots of sauce on hand. The sauce should be much thinner and more generously applied than conventional pasta sauce, due to the highly absorbent nature of the pasta. Therefore, for this dish, I make my red sauce very thin, which means essentially that very little simmering is required. I sauté the onions in olive oil, add the tomatoes and basil, and cook for a mere 5 minutes or so. 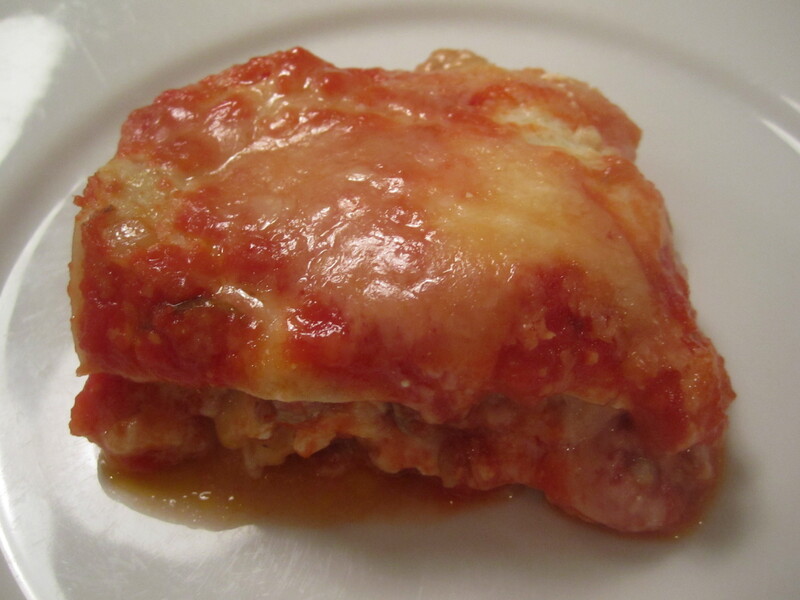 The béchamel is used sparingly in the red lasagna, so it can be ladled on in dollops of full-strength thickness. For the white lasagna, however, I thin the béchamel with chicken broth. The broth is essential in the white lasagna, to lighten up this otherwise very rich sauce. 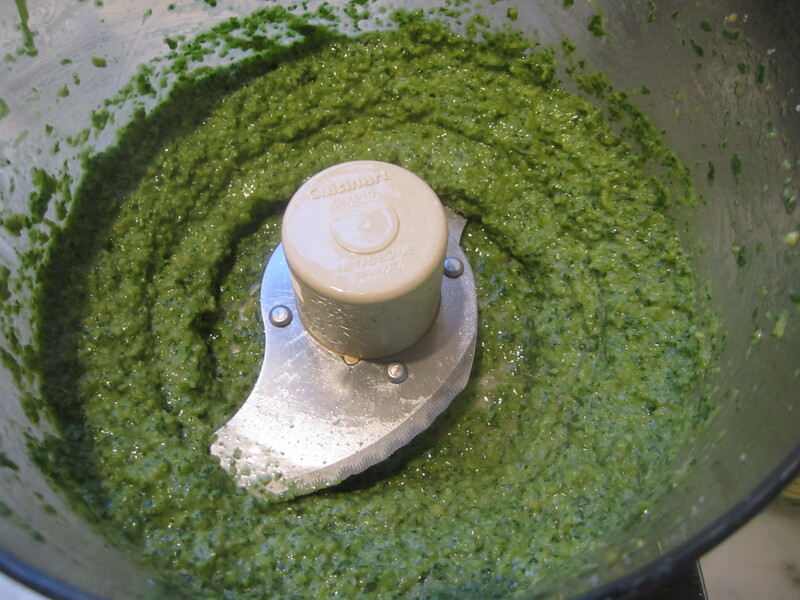 Also, for the white lasagna, I decided to add a cube of frozen pesto (optional), given to me by my 92 year-old neighbor, Beppi, made with the first cutting of basil from his garden. The beautiful thing about lasagna is that it can be prepared entirely in advance, and baked while your guests are arriving and settling in. 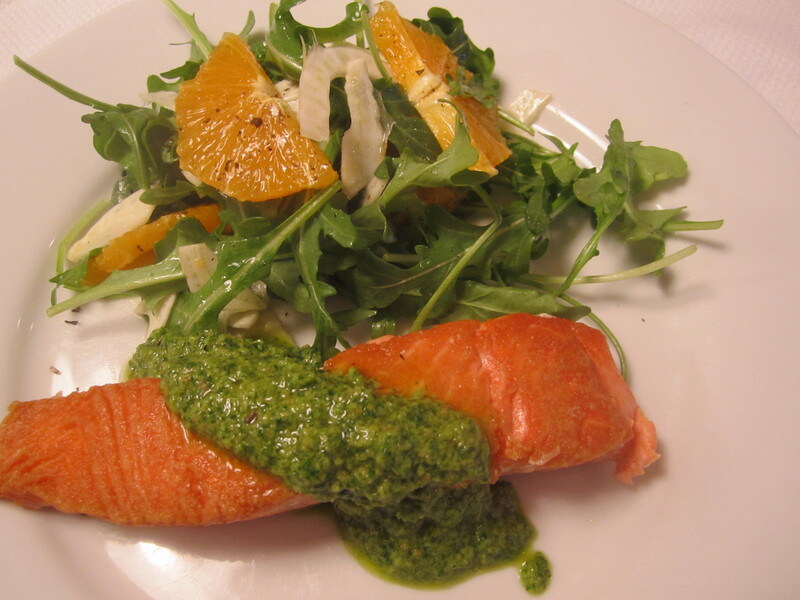 The cleanup is able to be done in advance, and all that is necessary to accompany this dish is a green salad, dressed as lightly and brightly as possible with lemon and olive oil. I discovered that despite the fact that all of my guests were meat-eaters, the favorite, by all accounts, was the white lasagna with vegetables. But, I’d urge you to try making both lasagne and allowing your guests to decide! 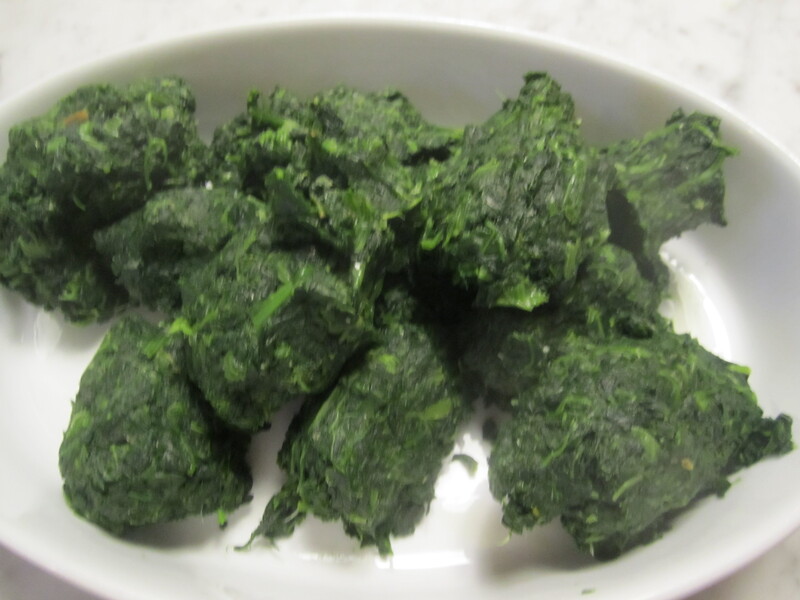 Thaw and squeeze the spinach as tightly as possible in small handfuls. Set aside. 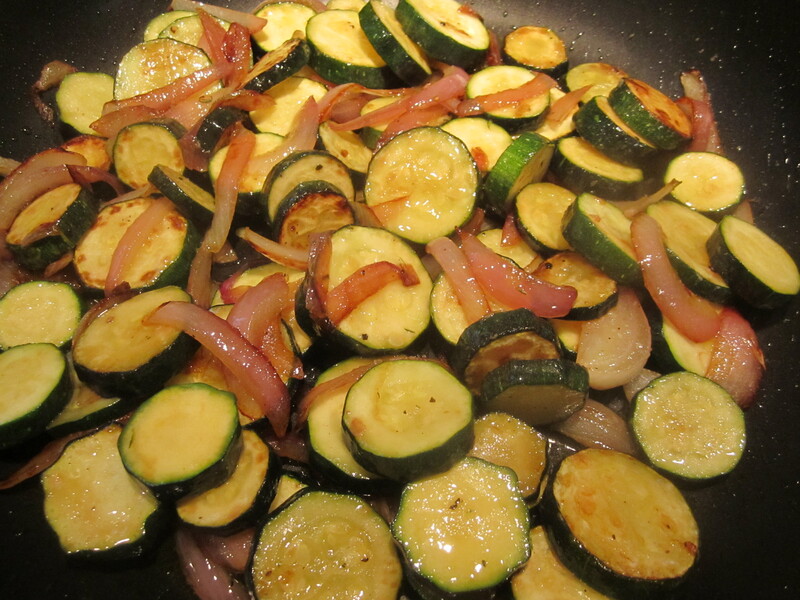 Slice zucchini and place in a large skillet with onion and olive oil. Saute on high heat for about 15 minutes, or until beginning to turn golden and soft. Season generously with salt and pepper. Set aside. Combine spinach, ricotta, and nutmeg in a bowl. Mix well, add salt and pepper to taste and set aside. Combine béchamel, pesto and chicken broth. 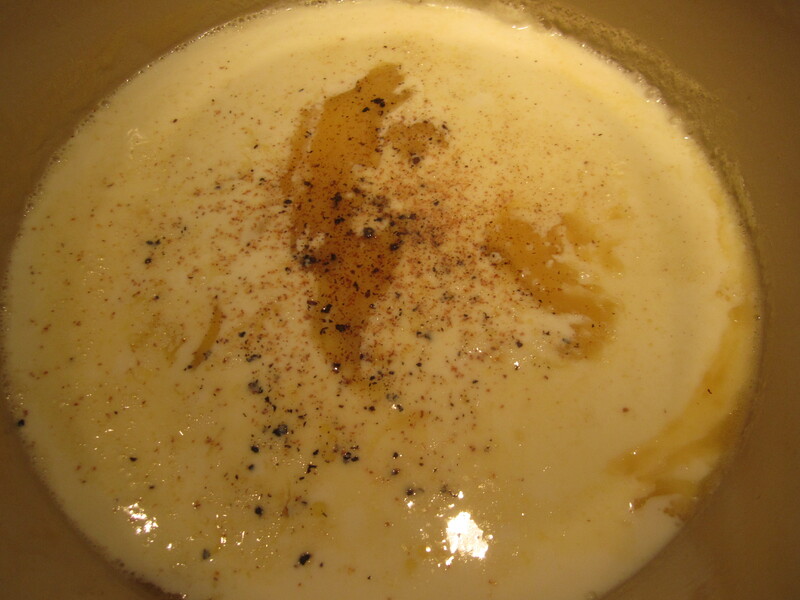 The resulting sauce should have the consistency of a light cream soup. 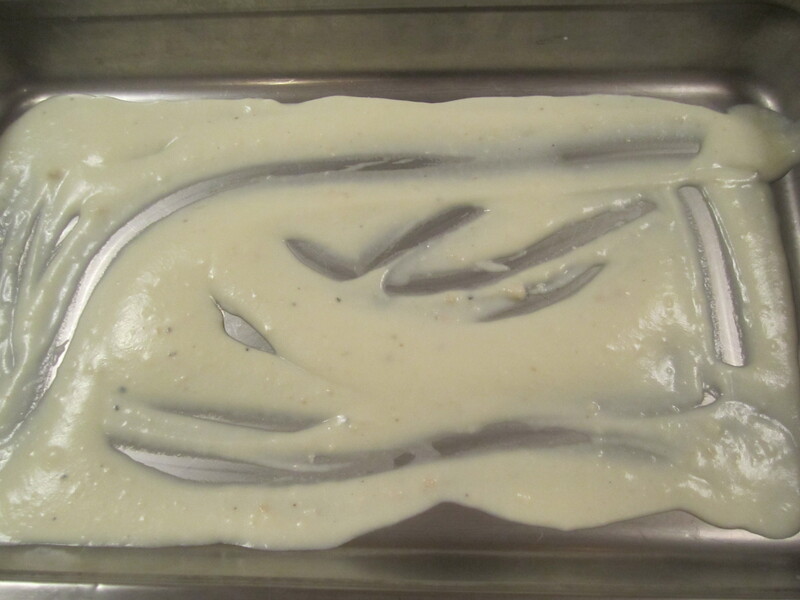 In a large baking pan (I used a ‘restaurant pan’, which measures approximately 12″ x 20″ x 2.5″ deep) spread a generous layer of béchamel on the bottom. Begin by adding a layer of pasta sheets, arranging to cover the bottom, without overlapping. If there are any large holes, simply break a sheet of pasta to fit the gap. There can be a bit of space around the noodles. 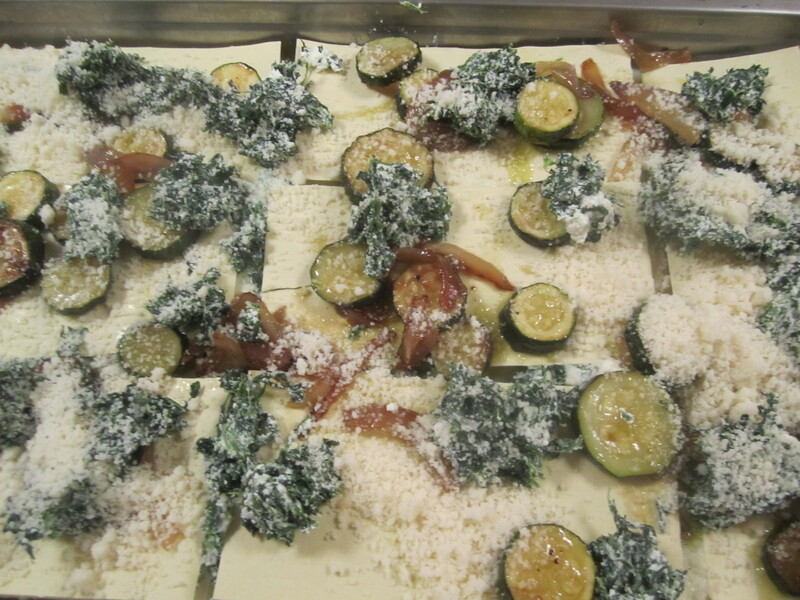 Add a dollops of spinach and ricotta, and a loose layer of zucchini/onion mixture. Sprinkle with plenty of grated parmigiano, and ladle on plenty of thinned-out béchamel. Repeat with 3 additional layers of pasta, for a total of 4 layers, pressing down on each layer of pasta before adding the next. 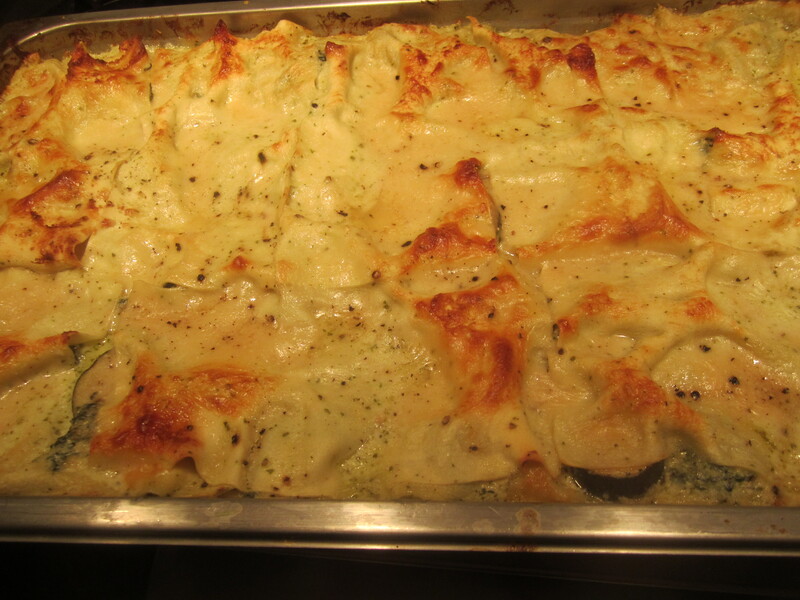 Finish the top layer with pasta sheets topped with only béchamel and grated cheese. Cover and bake for one hour at 375 degrees. Uncover and bake for 10 minutes to form a slightly golden crust on top. Let rest for approximately 15 minutes prior to carving. 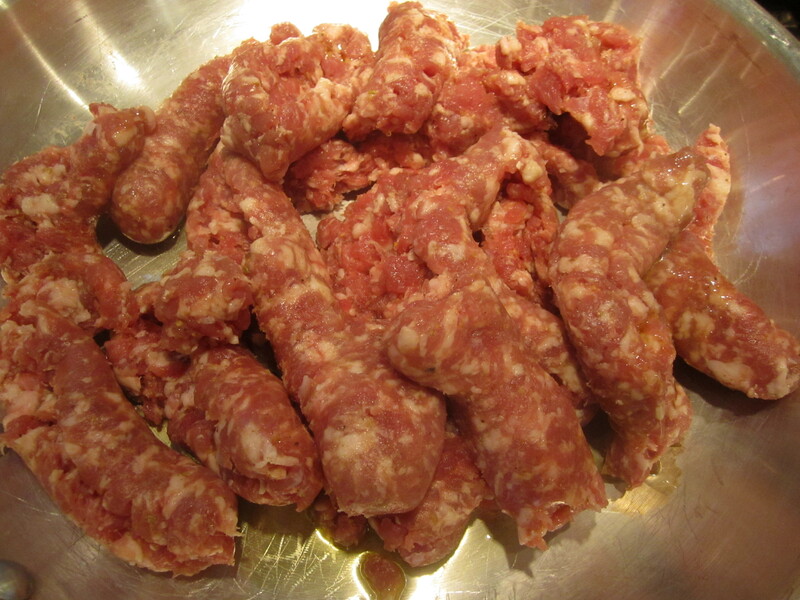 Remove sausage from its casing and saute in olive oil on medium heat, breaking up the chunks with a metal spoon. Continue sauteing and breaking up with the metal spoon or spatula until it becomes golden and slightly crisp around the edges. Set aside. 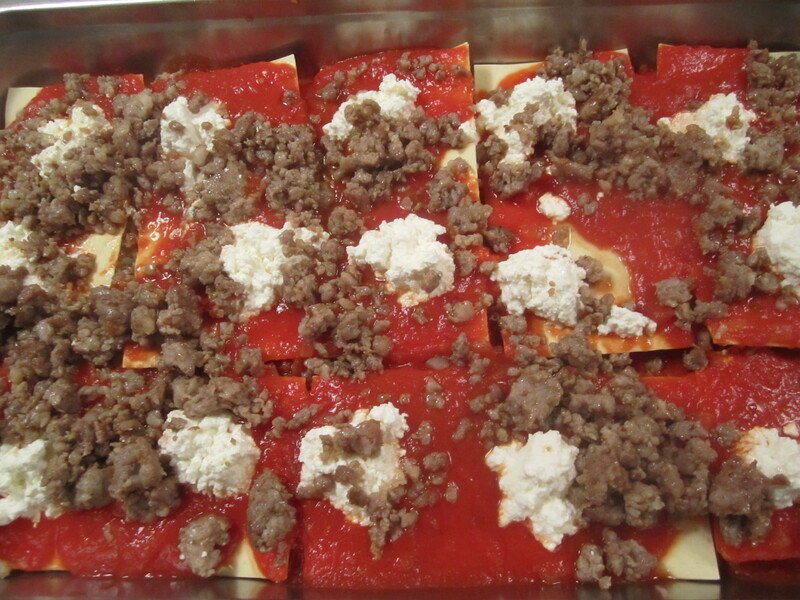 In a large baking pan (approximately 12″ x 20″ x 2.5″deep), spread a layer of tomato-basil sauce. Add a layer of pasta sheets, not overlapping. 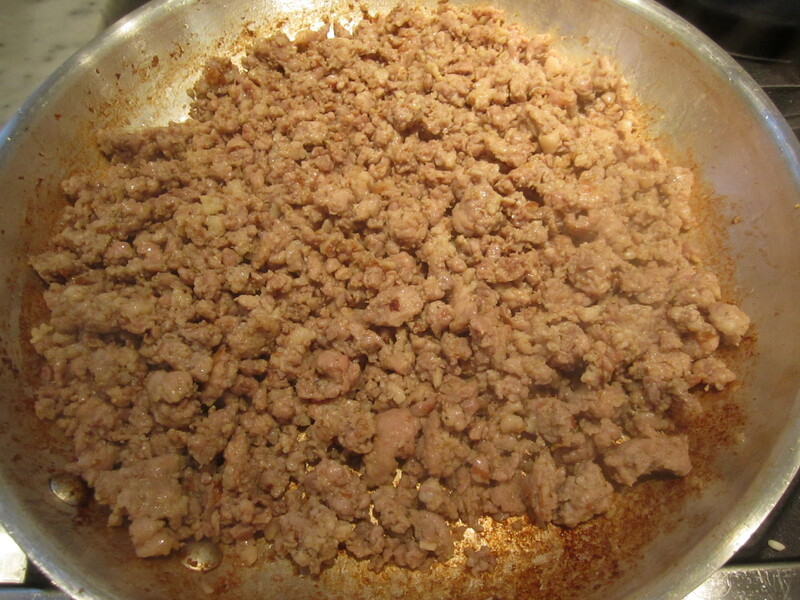 Spread sausage evenly in one layer. Add tablespoon-size dollops of ricotta, then sprinkle generously with grated cheese. Top generously with dollops of béchamel and tomato sauce. Hold back on the béchamel, but be generous with the tomato sauce. The tomato sauce is the liquid medium in which the pasta will cook–the béchamel is just to add a rich texture and creamy undertone. 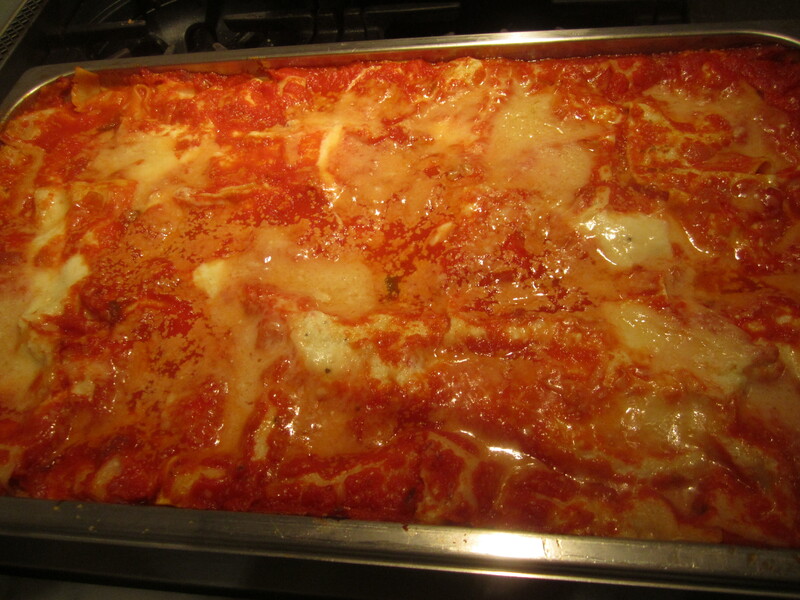 Repeat with 3 additional layers of pasta, topping with tomato sauce, béchamel and lots of grated cheese. Bake, covered tightly with foil, for approximately one hour. No need to brown the top of this lasagna. Remove from oven and set aside for 15 minutes to settle before carving. 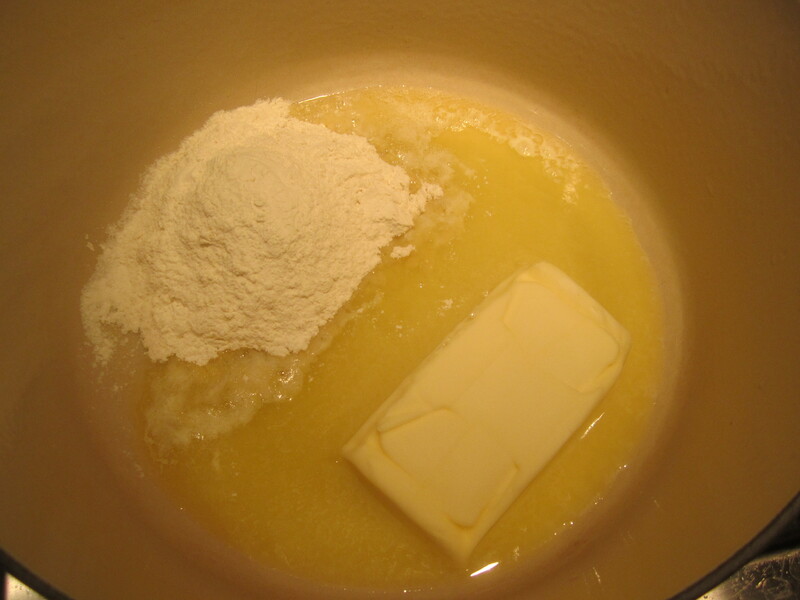 In a heavy saucepan on medium heat, place butter and flour. Whisk over medium heat for about 5 minutes, or until flour and butter are thoroughly combined. Do not brown. Turn flame to high and add milk. Bring to a simmer and reduce heat to low. Add nutmeg, salt and pepper. Whisk and stir until thickened. Should be a thick consistency. Set aside to partially cool. 1 large red onion, peeled and diced finely. 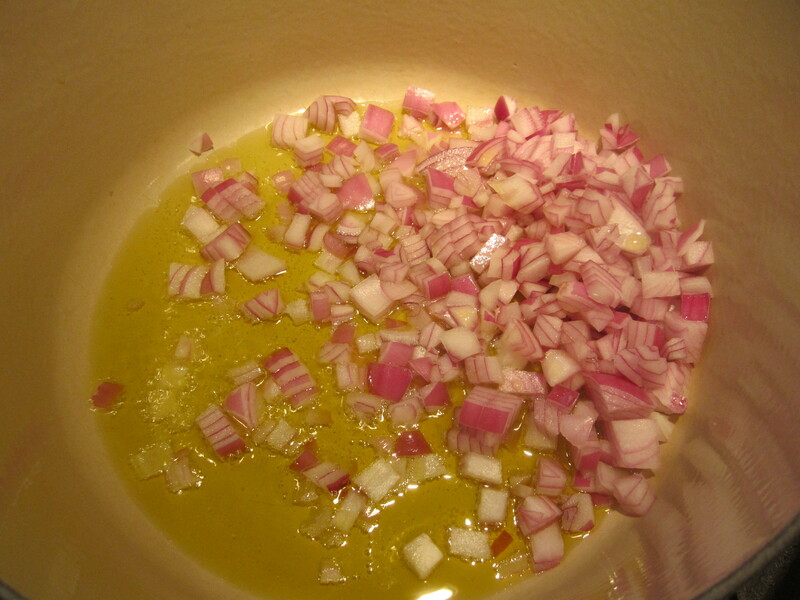 In a heavy saucepan, combine onions and olive oil. Saute on low heat for approximately 10 minutes, or until onions have wilted but not browned. Add tomatoes, basil, and a generous amount of salt and pepper. Bring to a boil, and lower heat. Simmer for 5 minutes. Add salt and pepper to taste. Remove basil stalks. Set aside to partially cool. This pesto is a bright, rich and slightly tart sauce that’s great for fish and seafood. 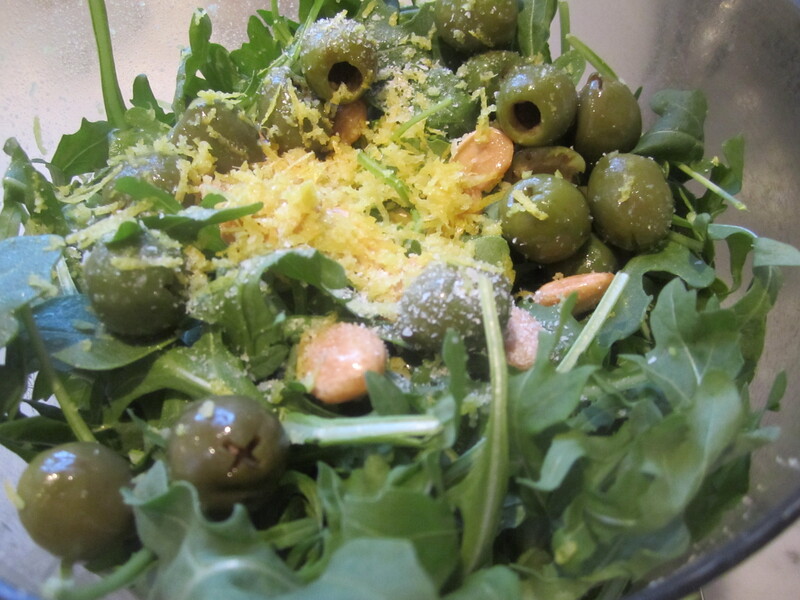 The ingredients in my market that inspired this meal were Marcona almonds and pitted green Sicilian olives. I could tell that these olives were at a perfect stage of curing–still some brightness left in their color–tart, but not too deeply cured flavor. 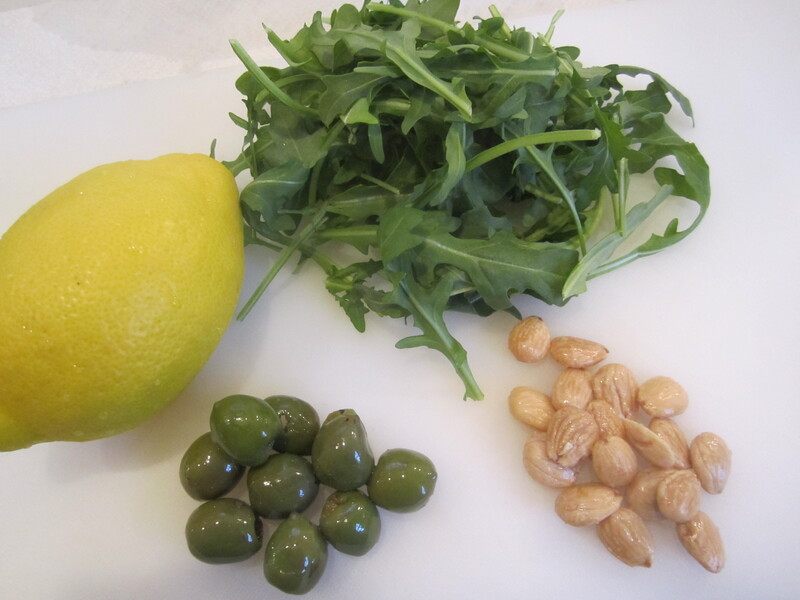 Together with arugula, lemon zest, and lots of olive oil, these ingredients make the foundation for a beautiful, simple sauce. This sauce is more flavorful and developed if made a couple of days before serving, and holds in the fridge without any discoloration whatsoever. 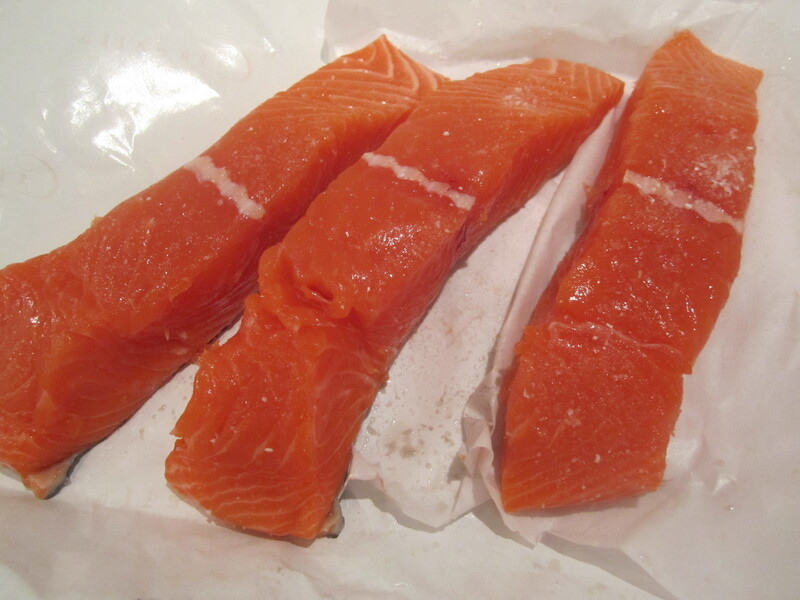 My fish market had the most perfect-looking, deep pink wild king salmon–worth the splurge. 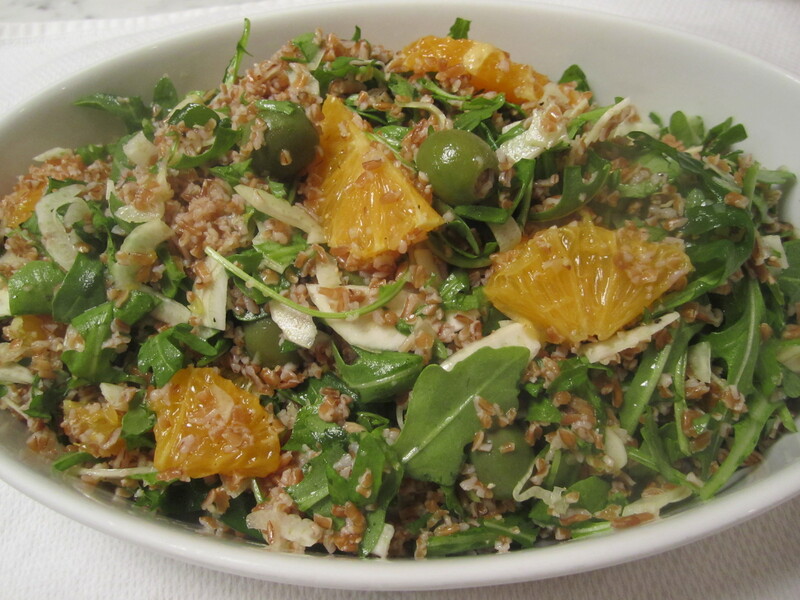 With the fish, we had a crunchy, fresh salad of arugula, shaved fennel, green olives, oranges and bulghur, dressed with olive oil and lemon juice. Process until a coarse puree forms. Spoon over grilled fish or seafood of almost any kind. I love a good burger or croquette of almost any kind! Since I had a piece of wild king salmon leftover from last night’s dinner, I was determined to do it justice. These cakes were inspired by an earlier post of mine (tuna and potato croqettes). The croquettes in that earlier recipe were dipped in the traditional flour/egg/crumb mixture, then deep-fried. These cakes are easier and lighter, since they are merely coated with bread crumbs and pan-fried. In addition to the leftover salmon, I had leftover sauteed local spinach–a great addition to so many dishes–soups, risotti, stews. A package of frozen spinach, squeezed dry would also suffice. As a binder, I used mashed potato, bread crumbs and eggs. In addition, chopped chives, parsley and lots of dill added wonderful brightness of flavor and color. As an accompaniment, we had some great local asparagus, and more of the leftover salad with fennel, orange and green olives. Place potatoes in boiling salted water and bring to a boil. Simmer until tender. Drain and pass through a ricer into a mixing bowl. Allow to cool slightly before proceeding. 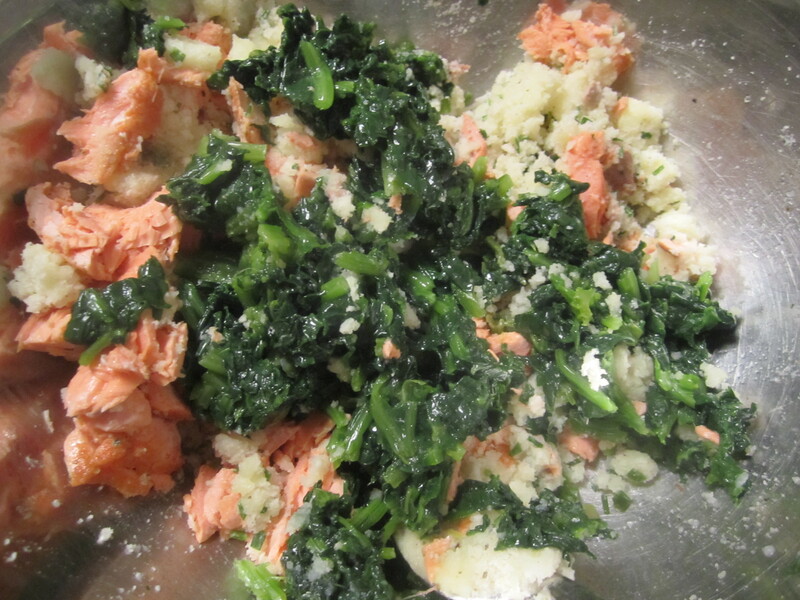 Combine salmon, mashed potato, seasoned crumbs, spinach, herbs and add salt and pepper to taste. Add eggs and form into four cakes. 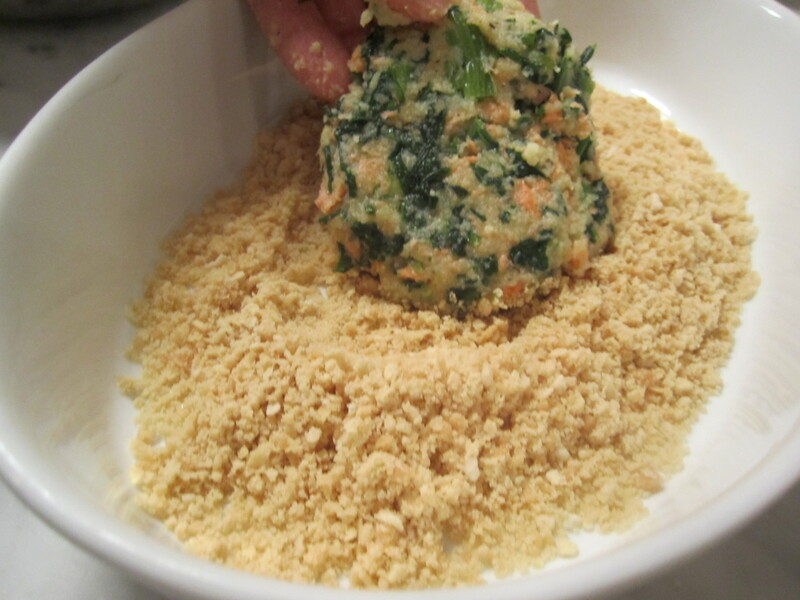 Dredge cakes in bread crumbs, pressing crumbs into the cakes to adhere. These are great hot or cold with a salad. 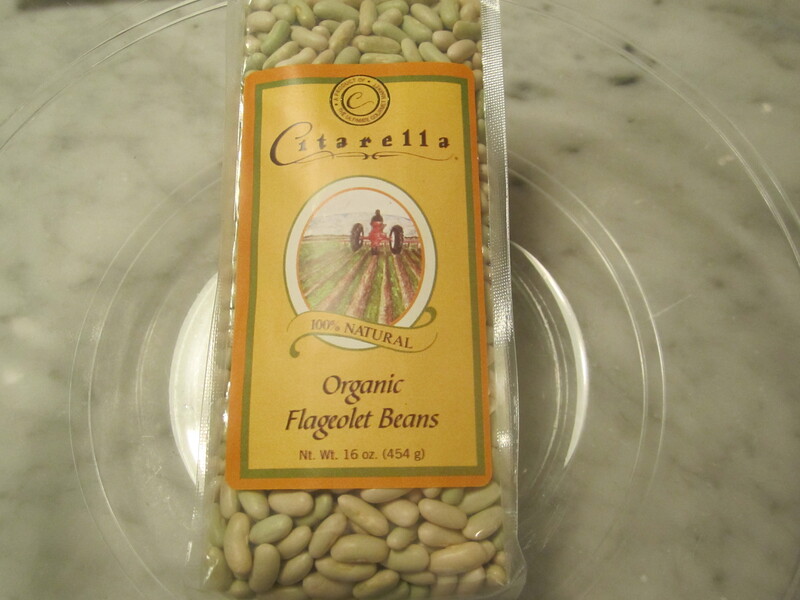 Flageolet beans are among my favorite varieties of dried beans– they’re small, green, and sturdy, and when cooked properly, remain soft and velvety on the inside. In addition, the scraps of turkey from yesterday’s turkey scaloppine that were not usable as scaloppine provided the meat for this dish. The dish requires a little forethought, since the beans need to soak overnight. The next day, I make the stew in stages, at my leisure. The beans get boiled, then cooled in their liquid. The farro gets boiled and set aside. As the beans cook, they perfume the house with the aroma of cloves and bay leaves. As the farro cooks, it adds a nutty aroma to the kitchen. 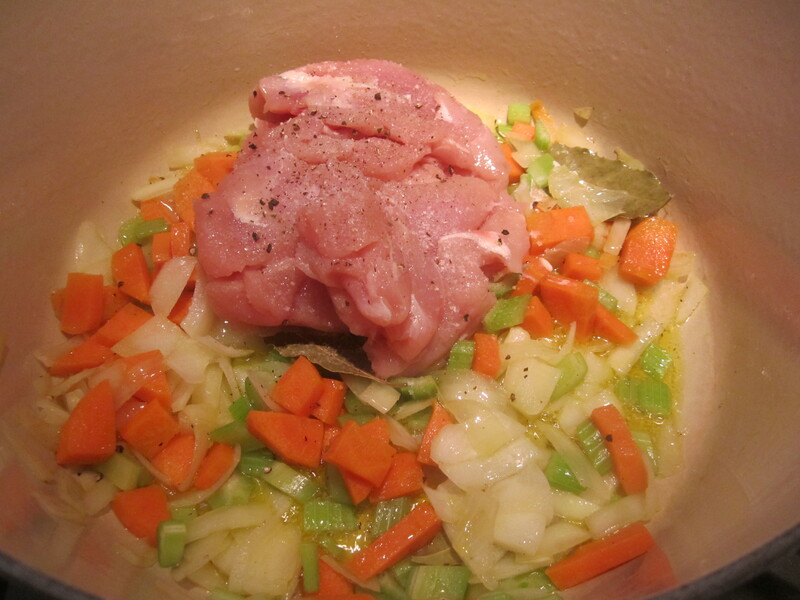 Later, I make the base for the stew, sauteing the aromatics and turkey chunks. I drain the beans, add bouillon cubes to the bean cooking liquid and add it back to the aromatics, as the base of the stew. All is combined, and at the last moment, a couple handfuls of baby spinach are added to lighten the stew, and make it fit for a one-pot meal–absolutely delicious. One pound of beans will easily serve 6 persons, but I prefer to think of it as three meals for two–the more the stew rests in the fridge, the better the flavor becomes on subsequent days. 1 c farro, boiled in salted water for about 30 minutes, drained, set aside, cooking liquid reserved. 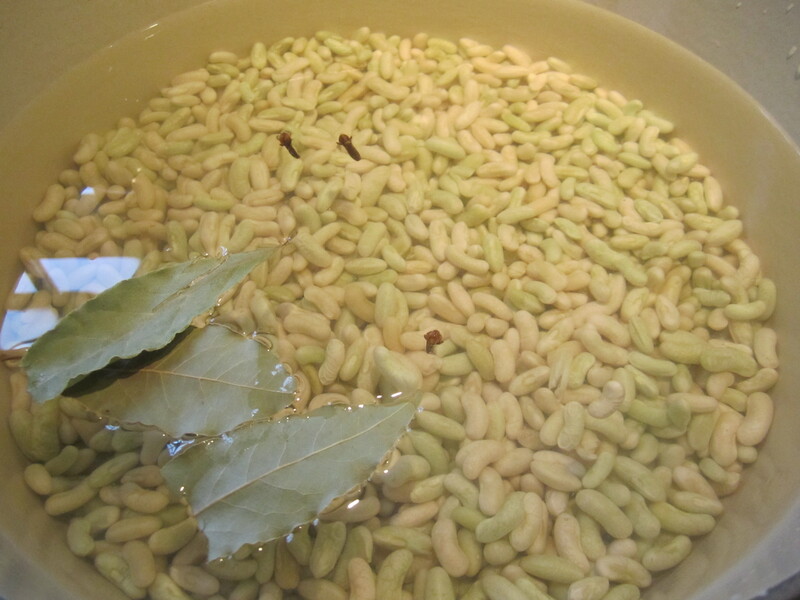 Place beans in cold water with 3 bay leaves and 3 whole cloves. Bring to a boil, then simmer on low heat, partially covered for about 45 minutes, or until tender. 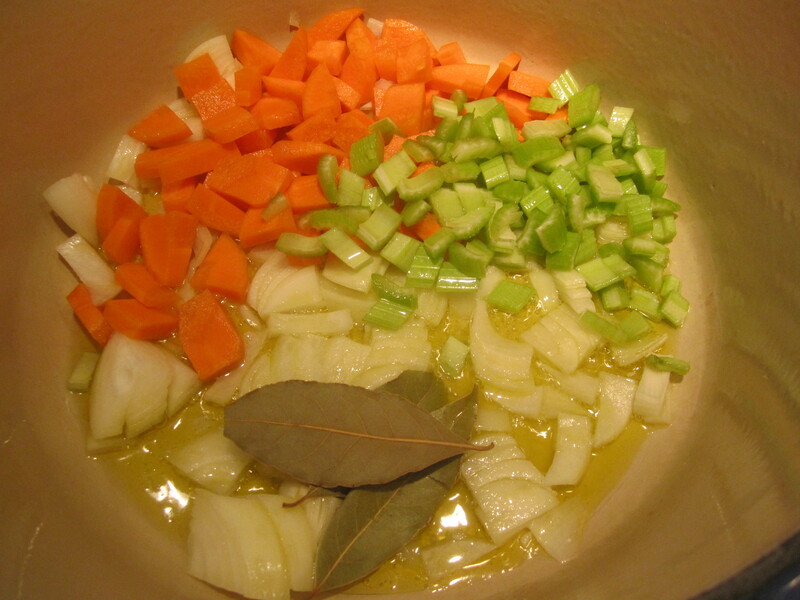 Remove the bay leaves and cloves. Strain the bean cooking liquid into a bowl and add bouillon cubes to dissolve. In a dutch oven large enough to hold the beans, combine the olive oil, carrot, celery, shallot, onion and saute on medium heat for about 5 minutes, or until just beginning to turn tender. Add turkey meat and continue sauteing until the meat loses its pink color (not much browning necessary). Add enough bean cooking liquid to cover the beans and bring to a simmer. 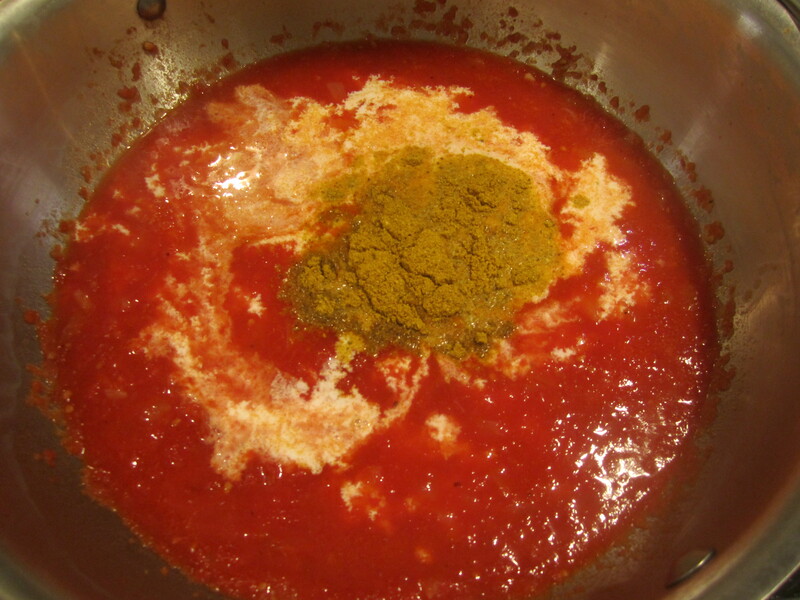 Add the parmigiano rind, tomatoes and tomato paste and continue cooking on low heat for about 20 minutes. 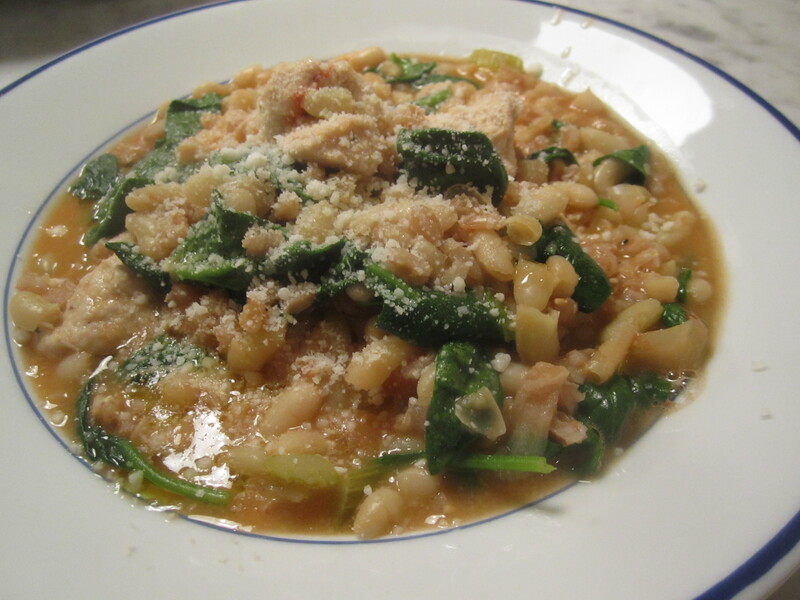 Add beans, farro, and more bean liquid, if a more soupy consistency is desired. 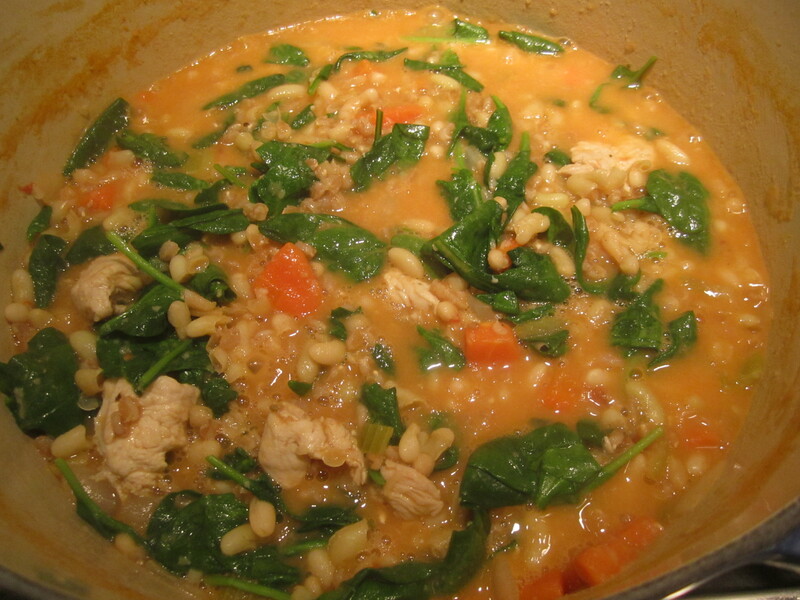 If even more liquid is desired, add in some of the reserved cooking liquid from the farro. 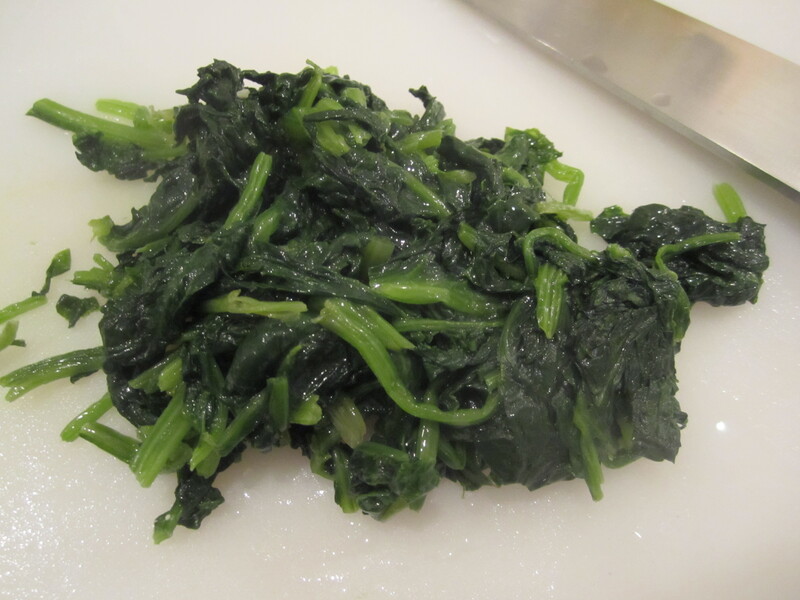 Just prior to serving, fold in a package or bag of washed baby spinach and stir in to wilt. Serve with a drizzle of extra-virgin olive oil and grated cheese on top. I continue to enjoy the wonderful dried porcini that my friend Kathleen dropped off on my doorstep last month. 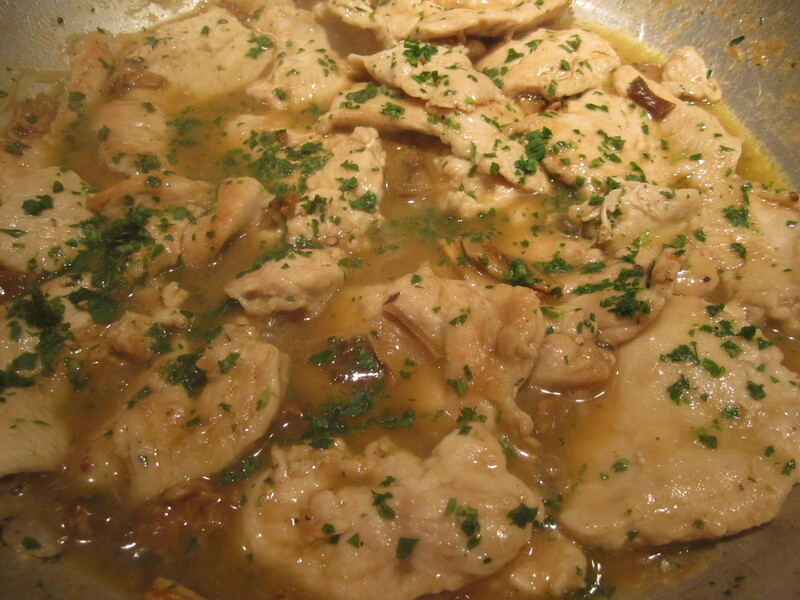 Tonight, I decided to add them my Turkey Marsala. 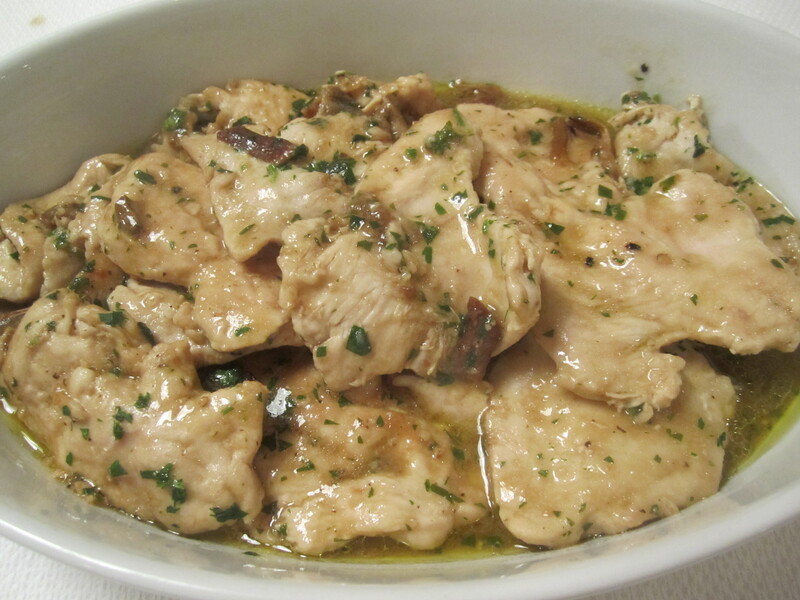 Turkey breast is a beautiful alternative to veal, for making alla marsala. Turkey has a deep, gamey flavor that goes so well with earthy flavors like porcini or truffles. At about one-fifth the price of veal (at my butcher, anyway), it’s a wonderfully economical alternative as well. 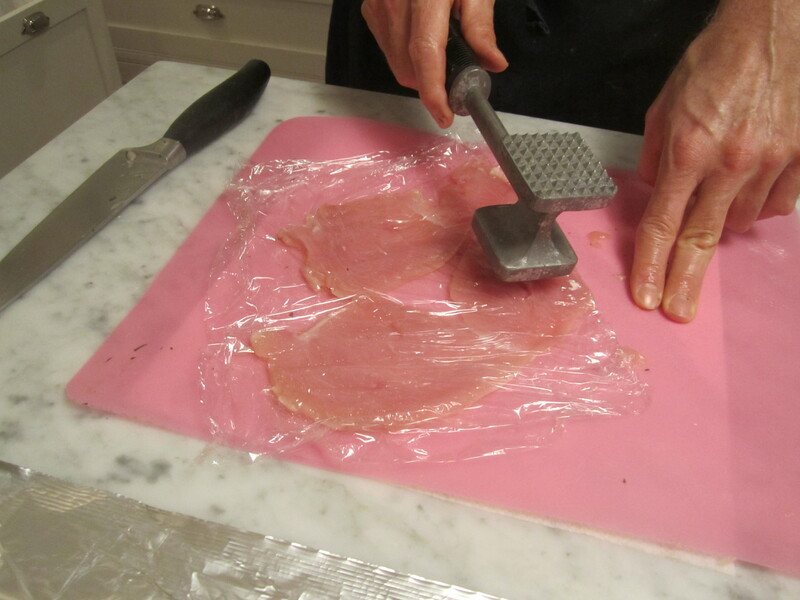 The entire key to making tender scallopine is properly butchering and pounding the meat to near paper thinness. This takes a little practice, but with some illustration, you’ll be able to tackle it as well. I learned similar techniques of making scallopine from both Mario and my neighbor, Beppi. 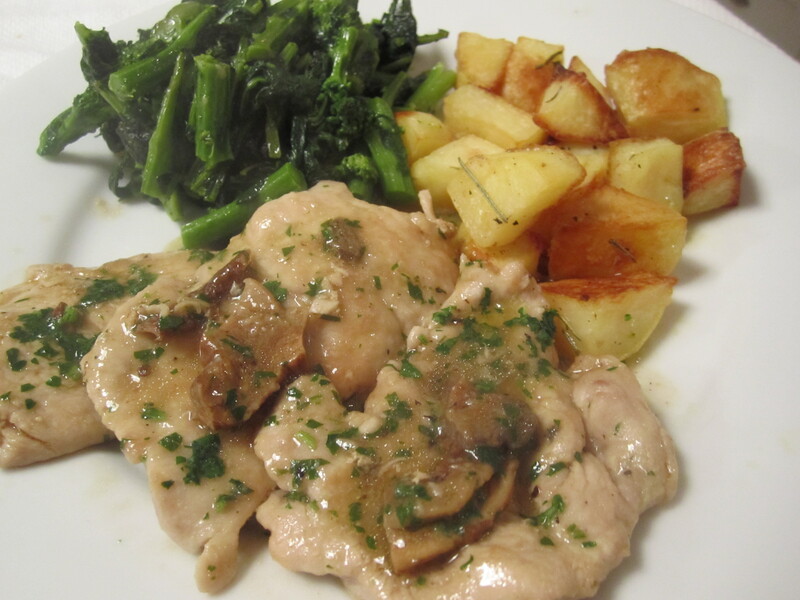 They both taught me the same lesson–the scallopine begin in a large cold skillet, slicked with oil and butter. The entire dish is arranged in the cold skillet, THEN the skillet is placed on the heat. 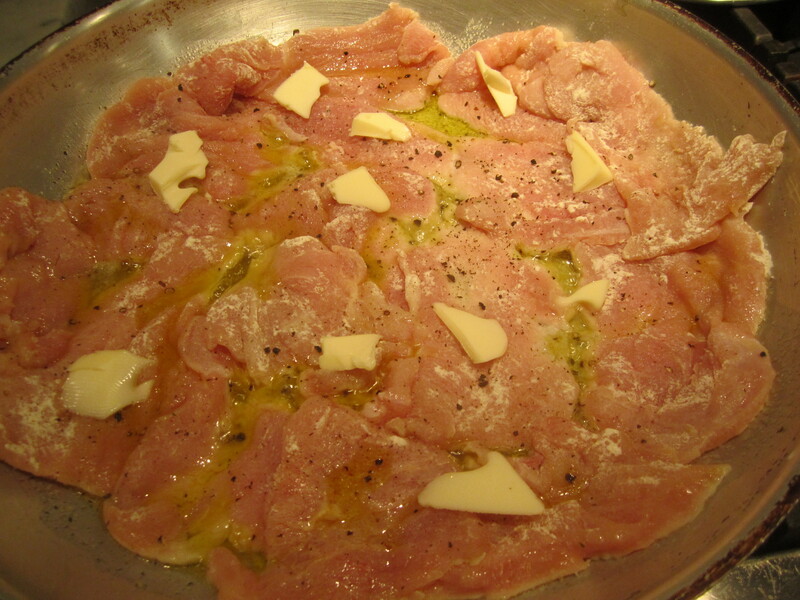 Do not heat the skillet, then slip the cutlets into hot fat–this will almost certainly lead to tough scallopine. You can see by the color of my finished scallopine, that the meat retains a pale, blonde color–with little or no browning–the key is juiciness and tenderness. Once the meat is butchered and the ingredients are assembled, the dish is very quick to prepare. For this reason, it’s a good dish to serve guests. Simply assemble ahead of time, begin cooking any accompaniments first, then place the skillet on the heat about 10 minutes prior to serving. Tonight, as accompaniments, we had roasted potatoes with rosemary and broccoli di rapa with chili flakes, and garlic. Remove skin from both lobes of the turkey breast by pulling off the skin while lightly running the knife between the skin and meat, being careful not to take skin with you. 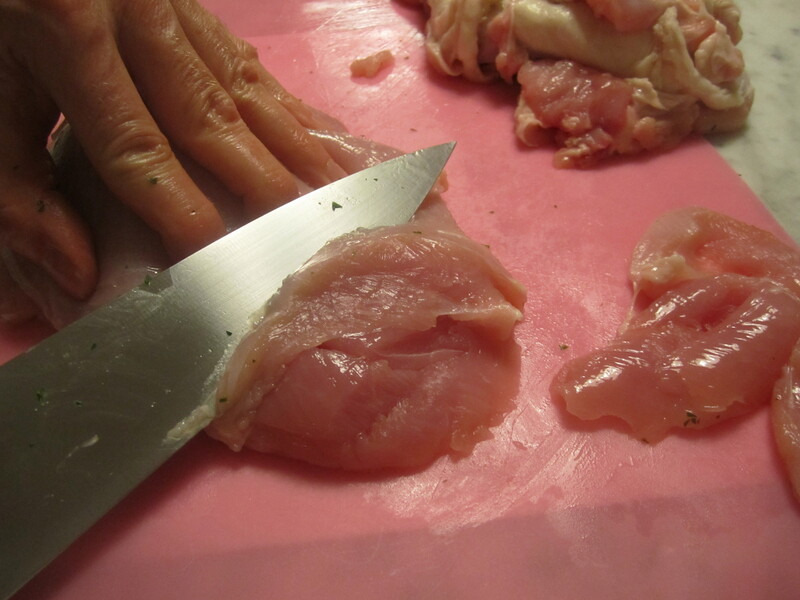 With a sharp knife, slicing crosswise at a diagonal, make 1/2″ slices of meat. Save any chunks or odd cubes of meat for another use. Take each slice and place between sheets of plastic wrap (you may do them two or three at a time, making sure there’s room around each slice within the plastic wrap, so the meat can expand as you pound it thinner). Pound with a meat pounder until slices are about 1/4″ thick, and as uniform as possible. This requires a firm but delicate touch with the pounder–too much force will result in shredded see-through cutlets, while too little force will result in cutlets remaining too thick to cook quickly, properly. 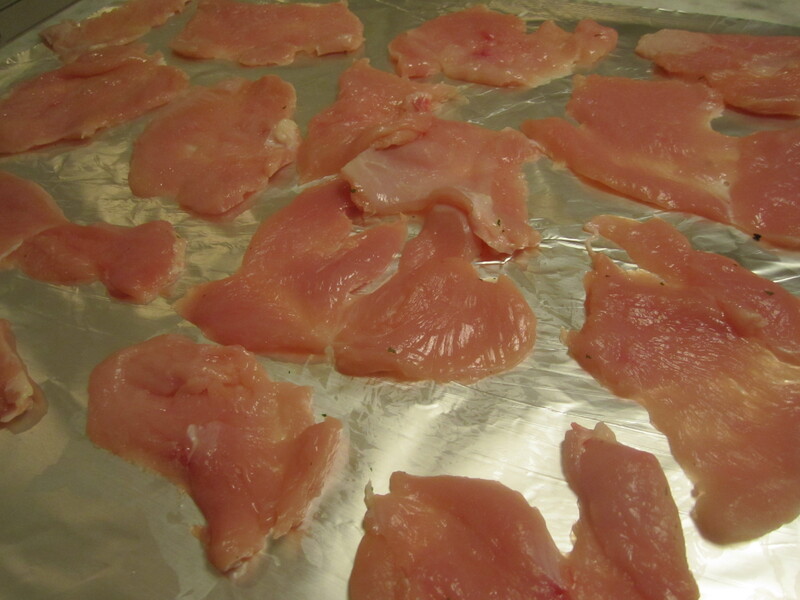 Your goal is to lightly break down the fibers of the meat and tenderize it ahead of cooking. 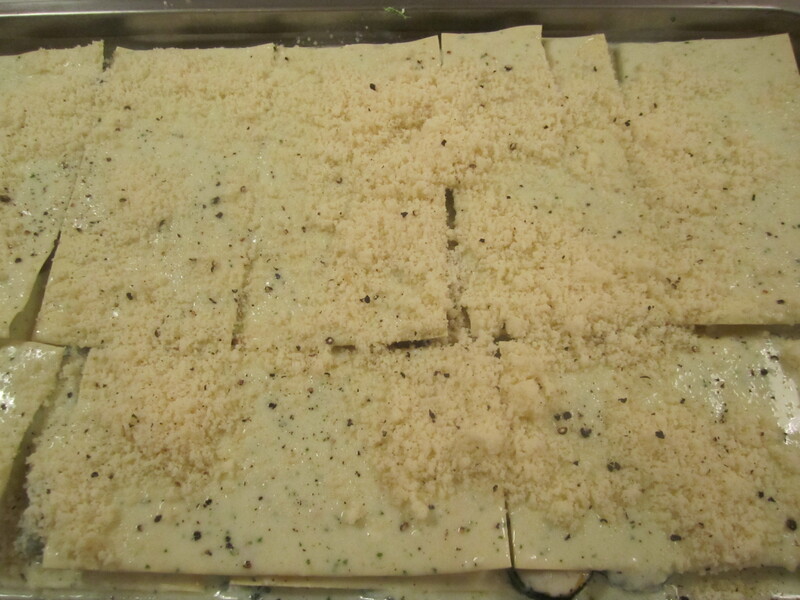 Set all slices aside on a sheet of foil, then prepare a tray of flour for dredging. Drizzle oil uniformly over the skillet, then dredge each cutlet in flour, while shaking off any excess flour from each piece before placing in skillet. 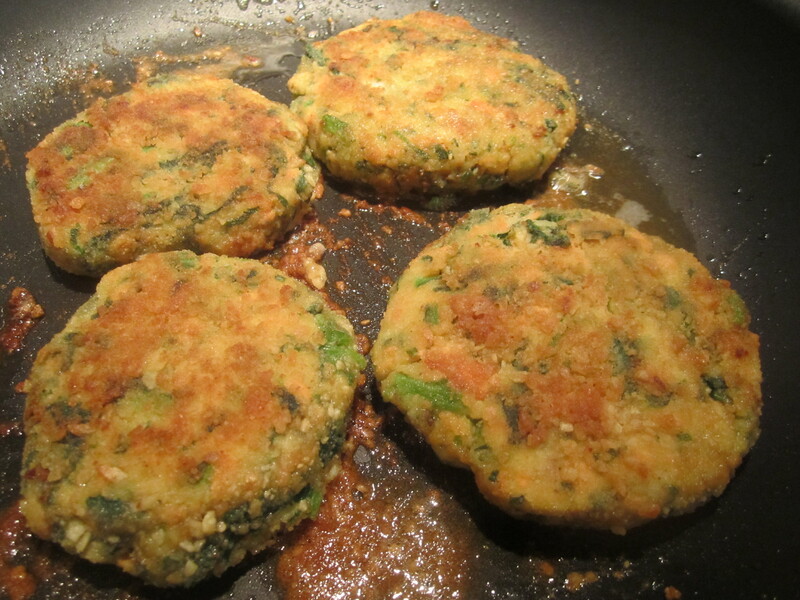 Lay the cutlets in the skillet–they may be crowded and slightly overlapping, since they will shrink a bit during cooking. Season well with salt and black pepper. Dot all uniformly with butter. May be prepared to this point an hour ahead of cooking. This is an exception to the prohibition on overcrowding the skillet while pan-frying, since the goal here is tenderness–not browning. When almost ready to serve, turn heat on high under skillet, and when contents begin to sizzle, reduce heat to medium. 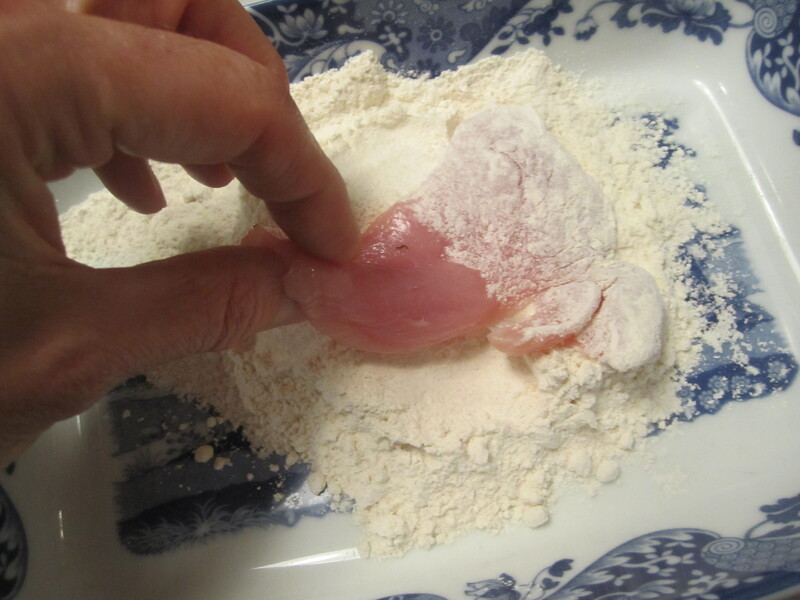 When cutlets begin turning white around the edges but still pink in the middle, turn them and turn up heat (about 4 minutes into cooking, depending on the strength of your flame). Add marsala and porcini and reduce for a minute. Add broth and continue cooking for another minute or two, just until sauce forms. Sprinkle with fresh parsley, taste for salt, and serve immediately.